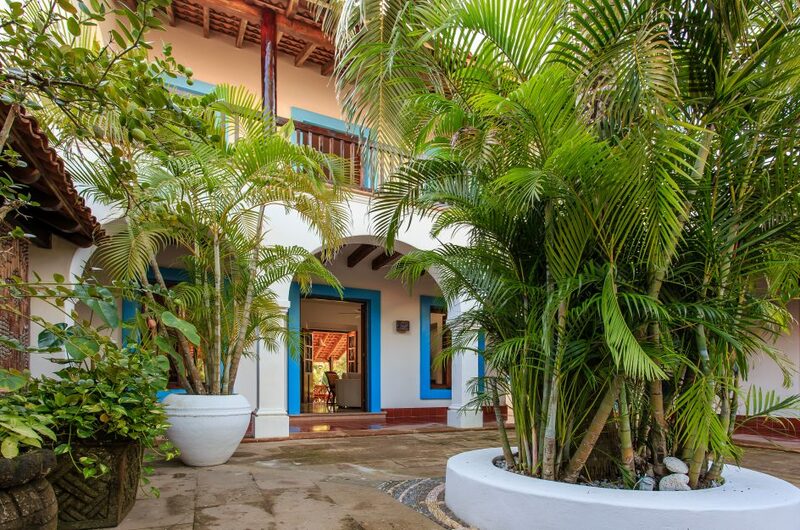 Every room at Hotel Esencia by any other standard would be called a suite. 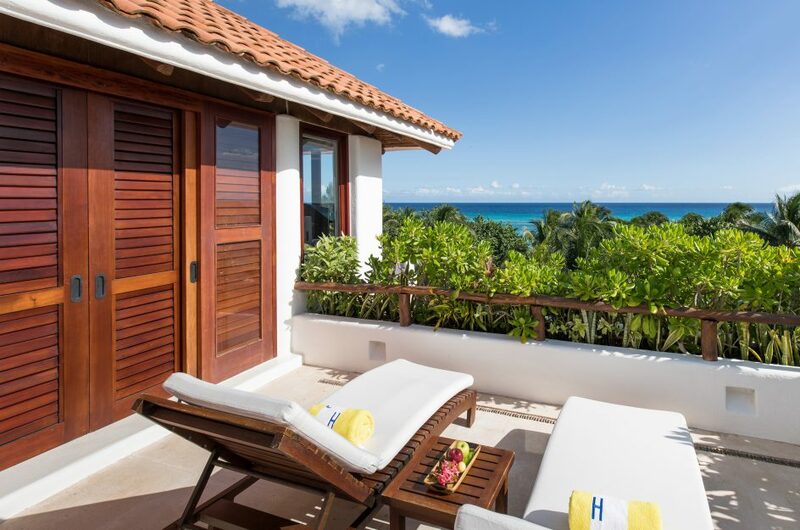 The private terrace and sitting area of the room offer a peaceful view on the garden canopy or an impressive panorama of the Caribbean. 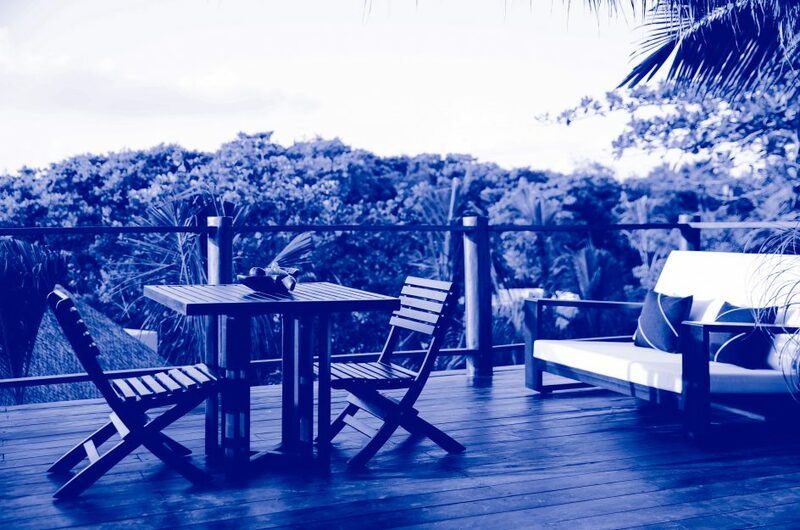 Each of our Penthouse Suites is truly a luxury apartment in the sky with sweeping jungle views high above the treetops. 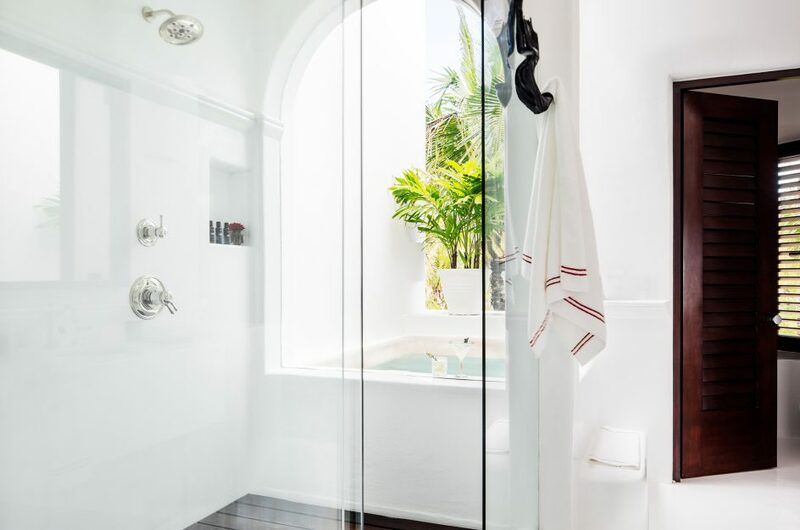 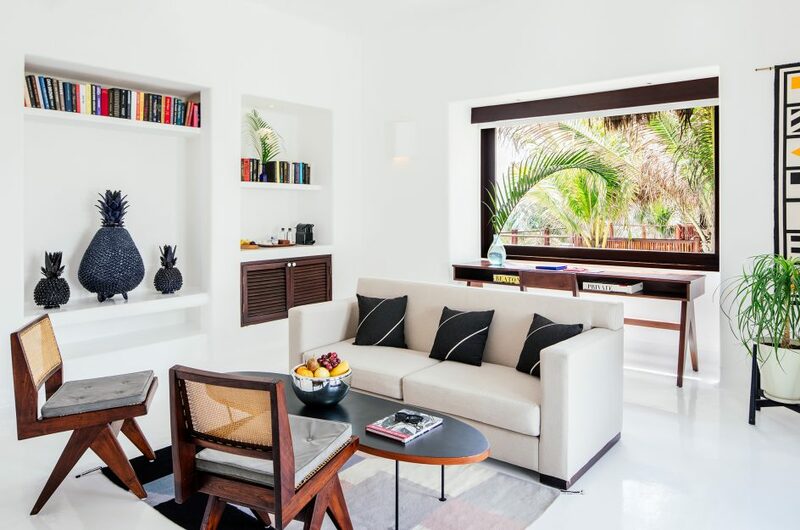 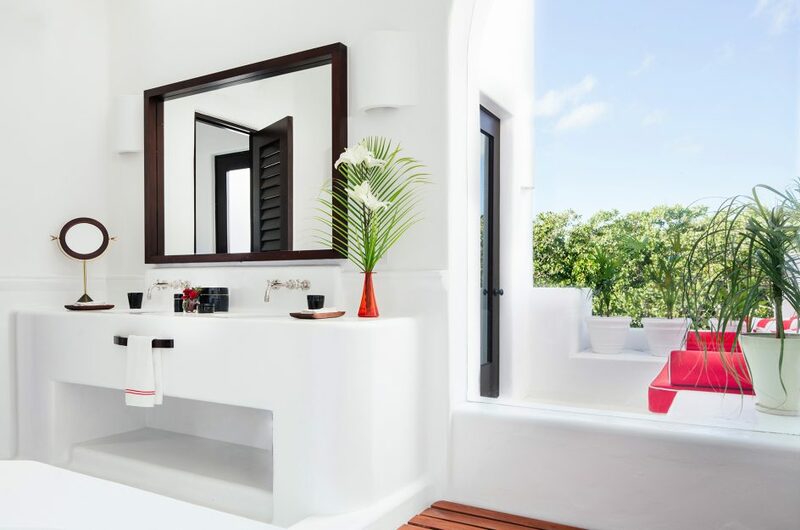 Perched three levels above our palm garden, these spectacular two storey suites feature a large master bedroom with king bed, a separate adjoining room, a spacious bathroom with double sinks, bathtub and walk-in shower, and a large outdoor dining terrace with sofa. 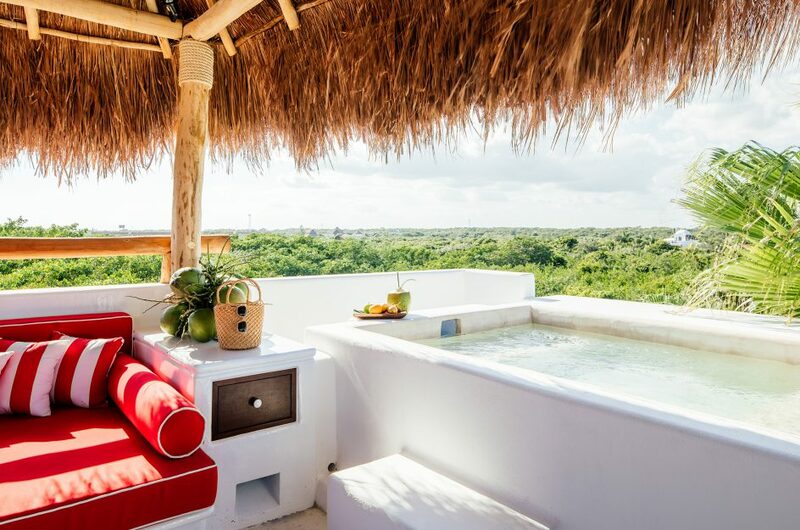 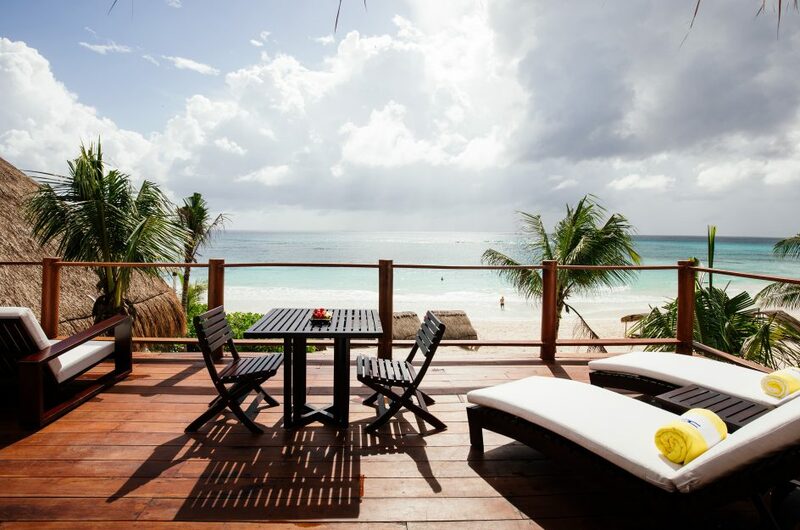 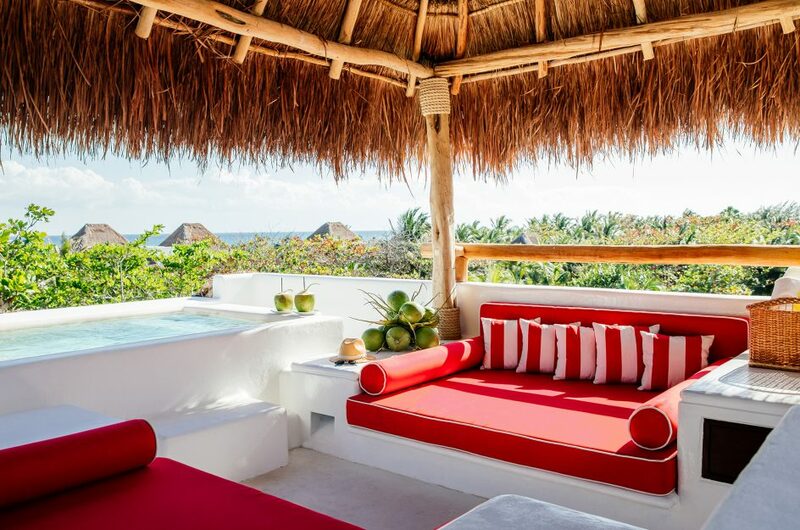 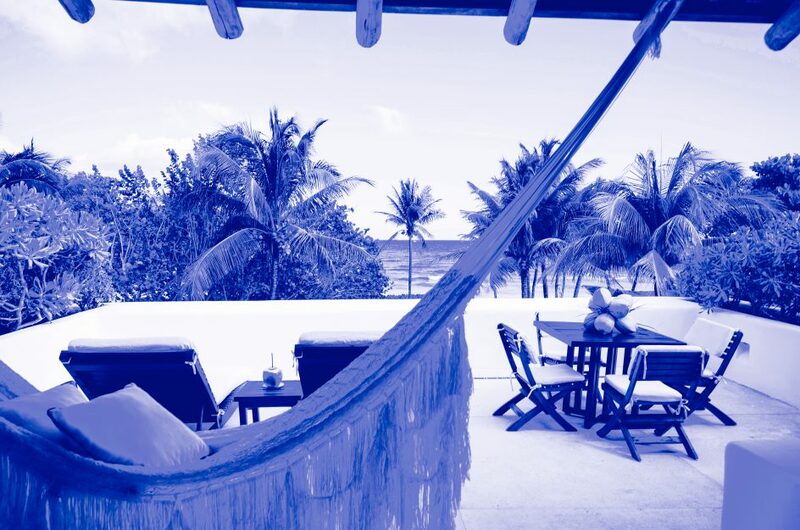 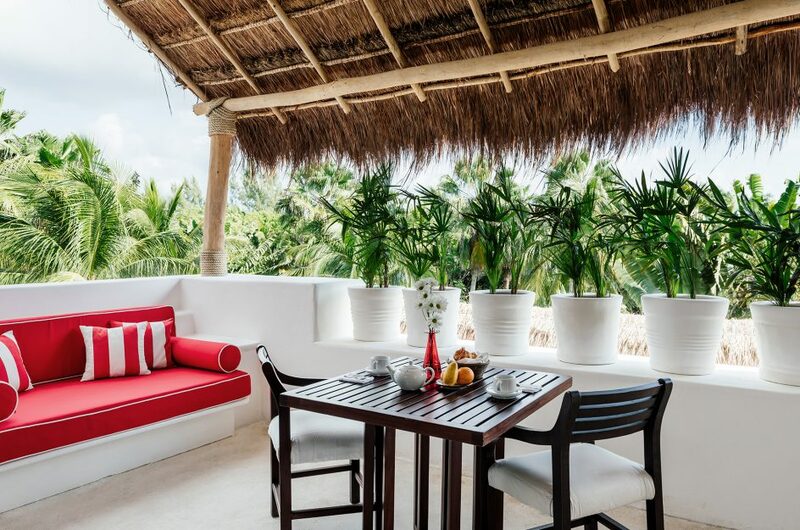 Up a short staircase is a private rooftop terrace with heated plunge pool and champagne bar overlooking all 50 acres of Hotel Esencia and Xpu-Ha bay from the highest vista. 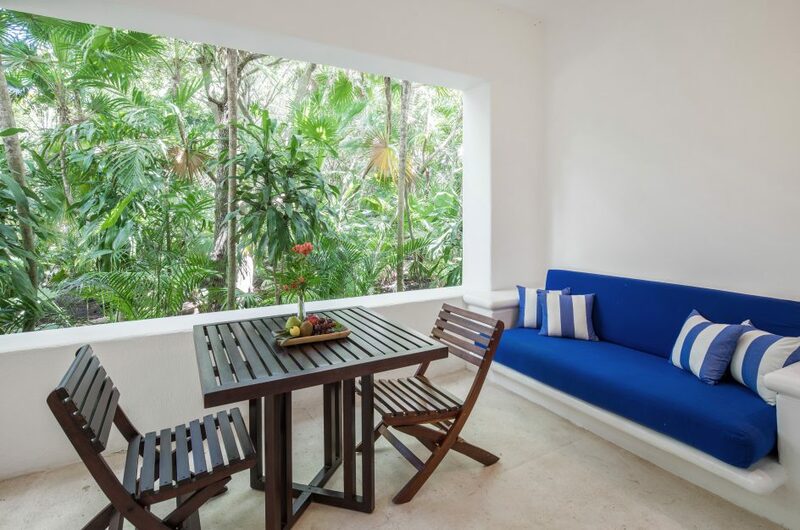 All accommodations at Hotel Esencia feature walk-in closets, large screen high definition televisions, and an in-room sound system with hookup for iPods and other digital accessories. 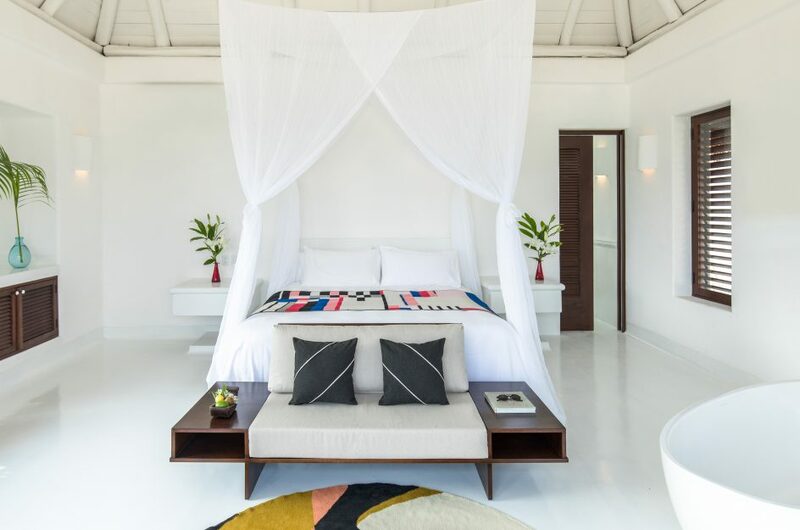 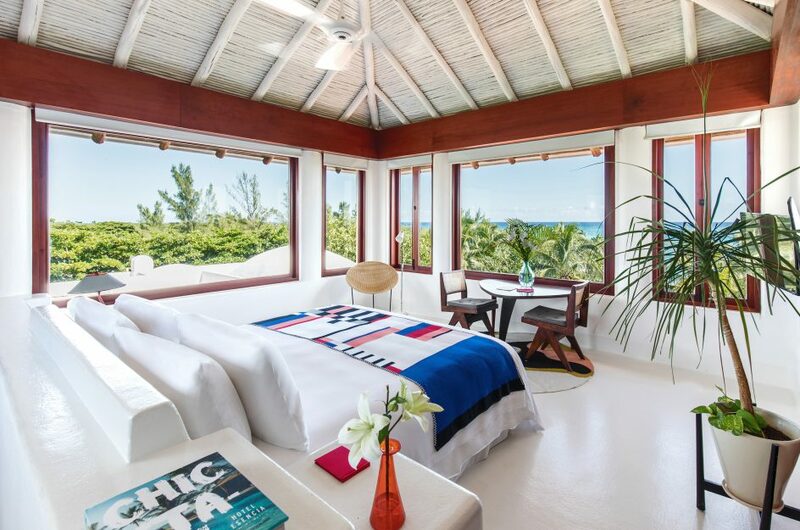 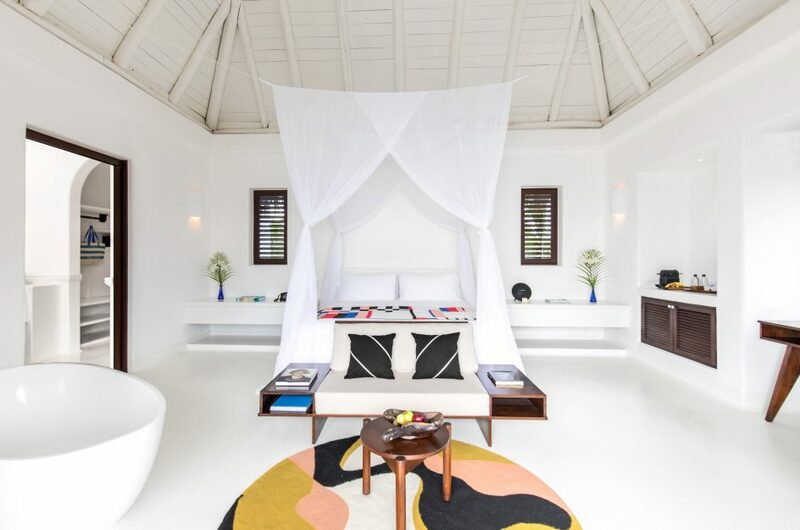 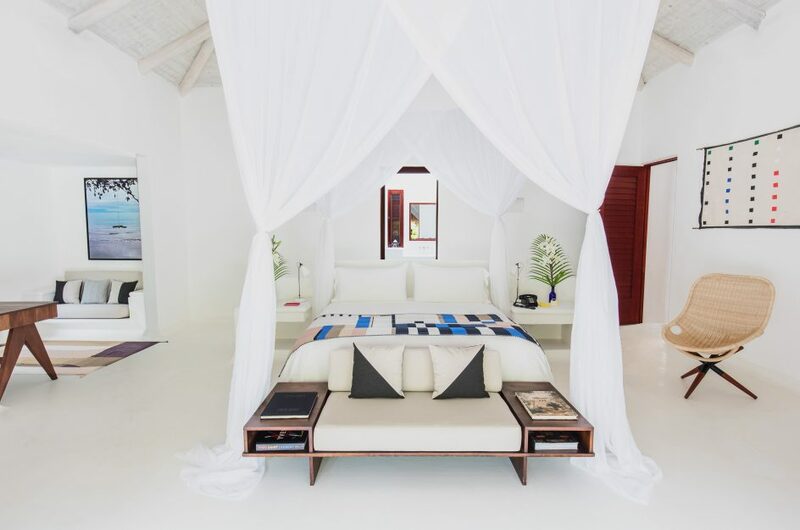 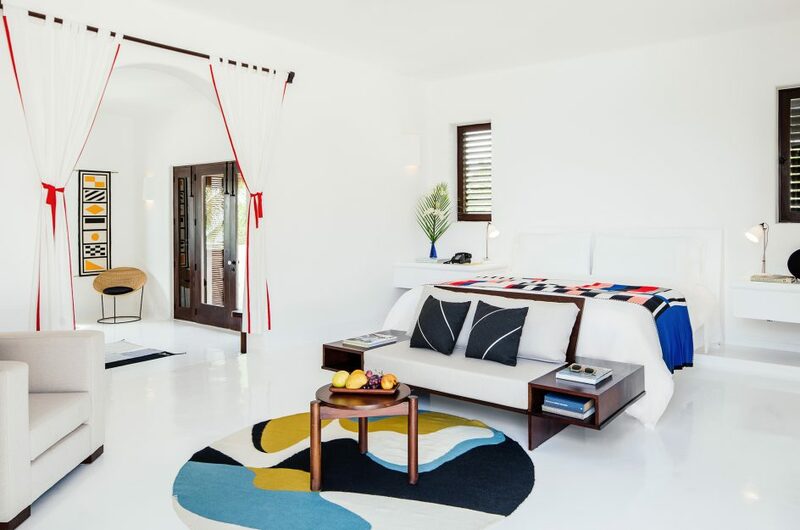 The two Master Suites of the main house each offer panoramic views of the grounds and the Caribbean. 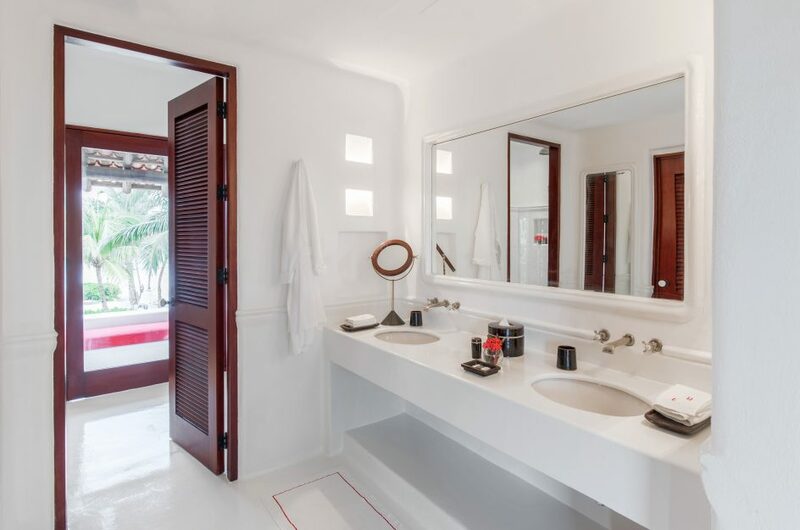 With a king bed, master bathroom, and grand terraces, these are the architectural diamonds of Hotel Esencia, steeped in history and world-class luxury. 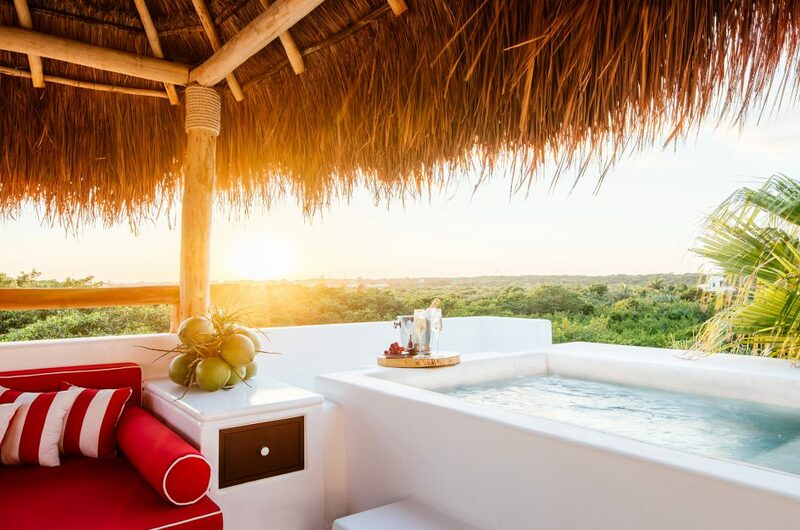 All accommodations at Hotel Esencia feature walk-in closets, large screen high definition televisions, and an in-room sound system with hookup for iPods and other digital accessories. 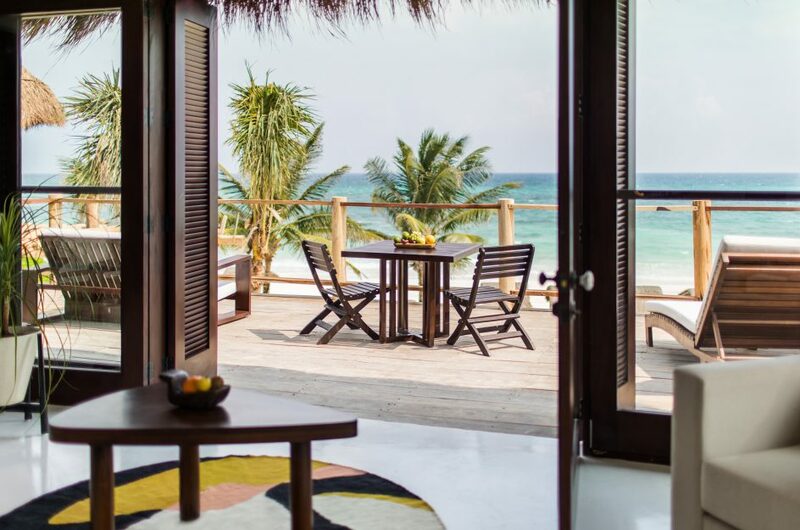 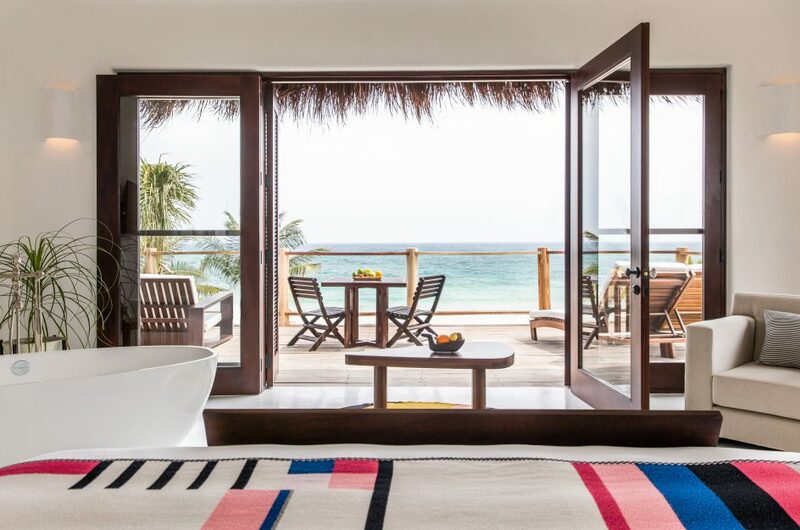 Barely 20 meters from the sea itself, and with unobstructed sea views, these sumptuous new suites will delight beach lovers looking for a true ‘barefoot in the sand’ experience together with the finest comforts of home. 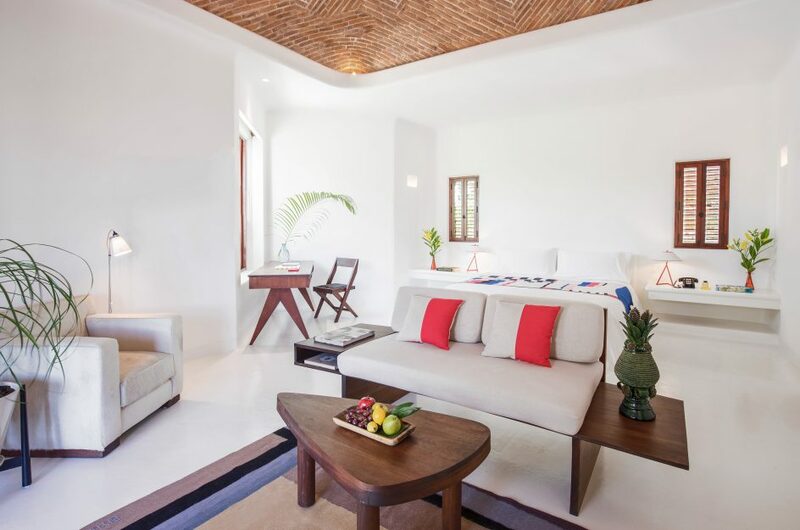 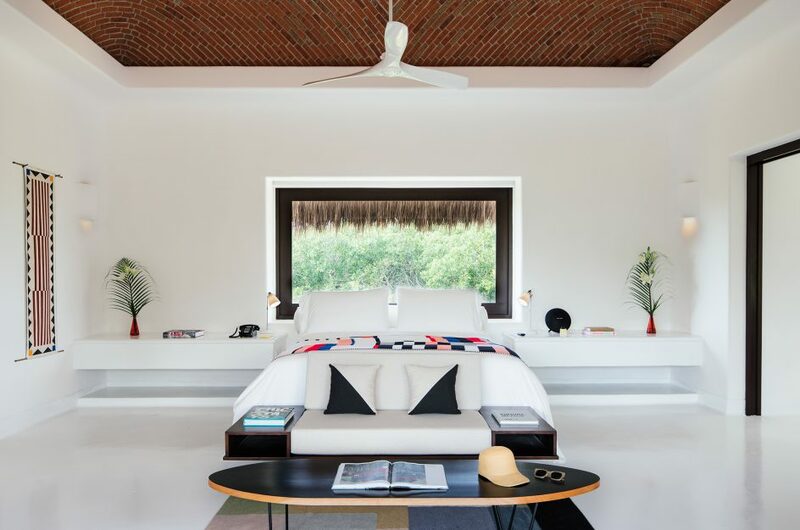 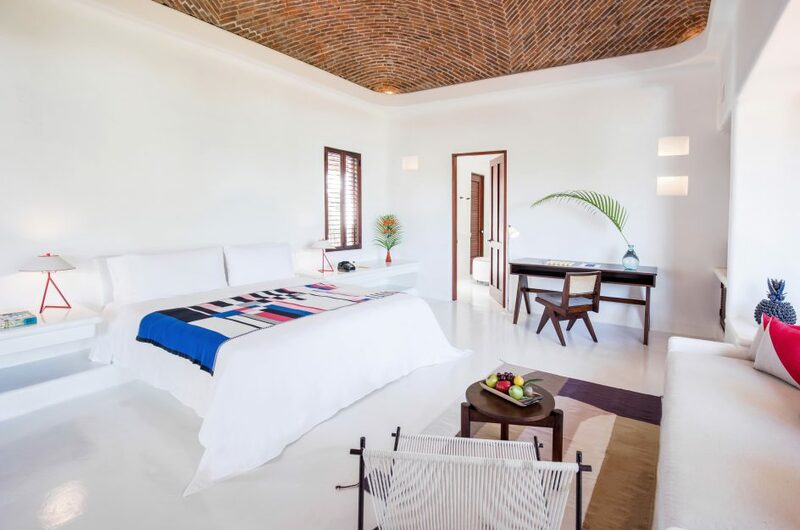 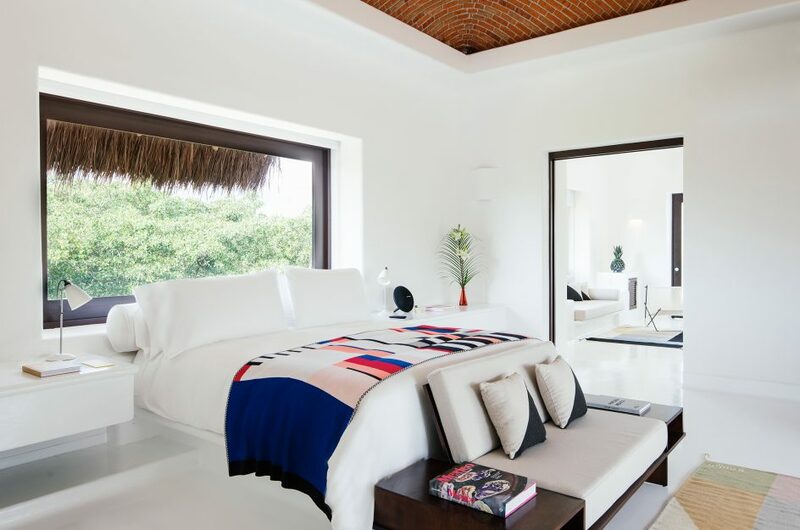 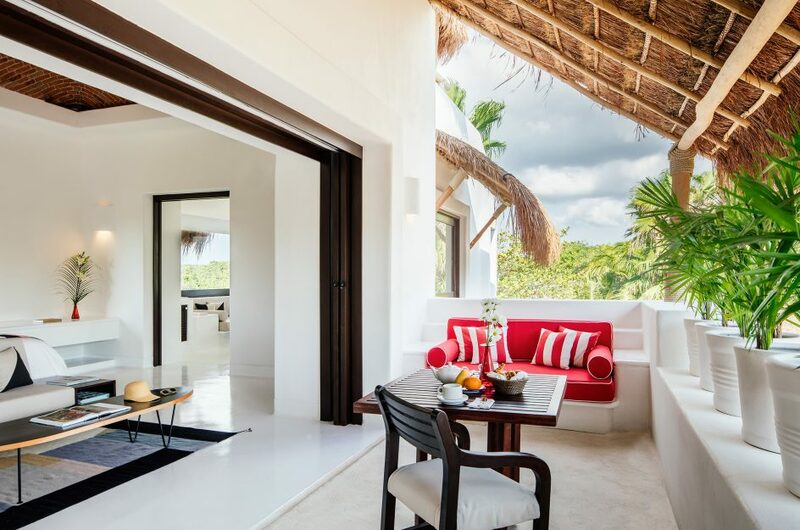 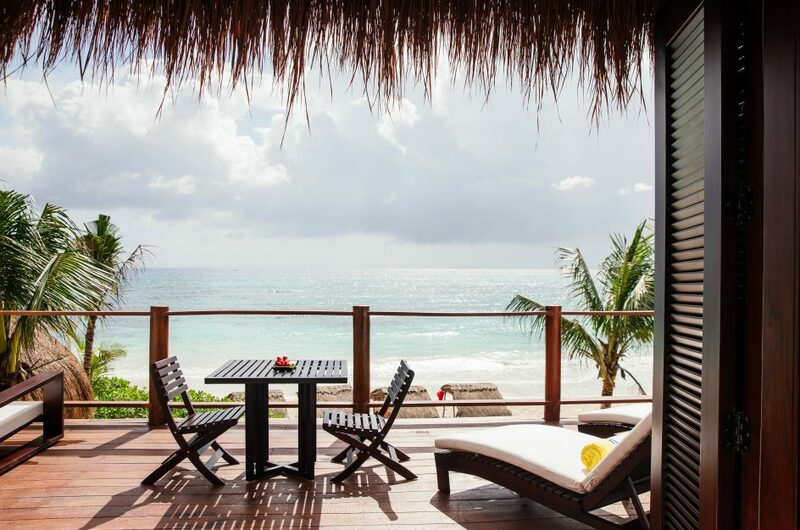 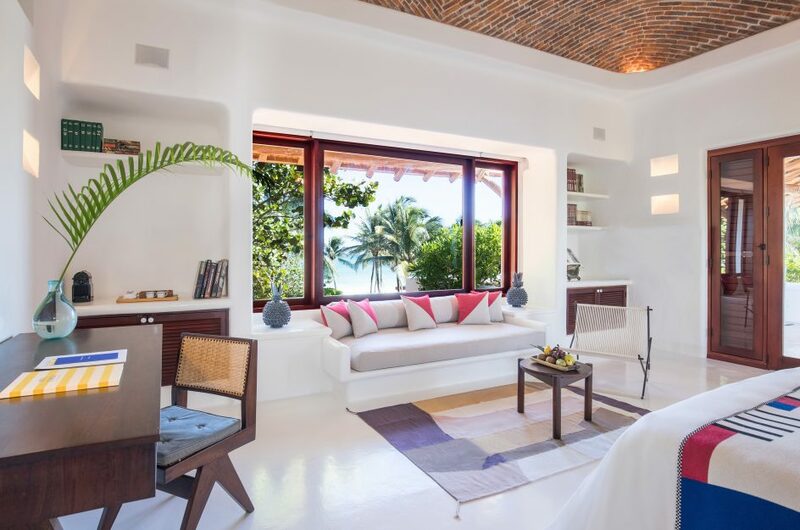 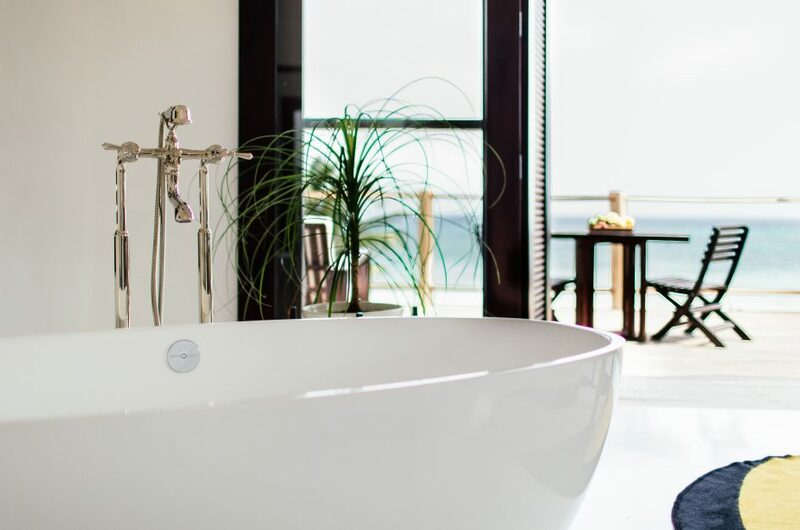 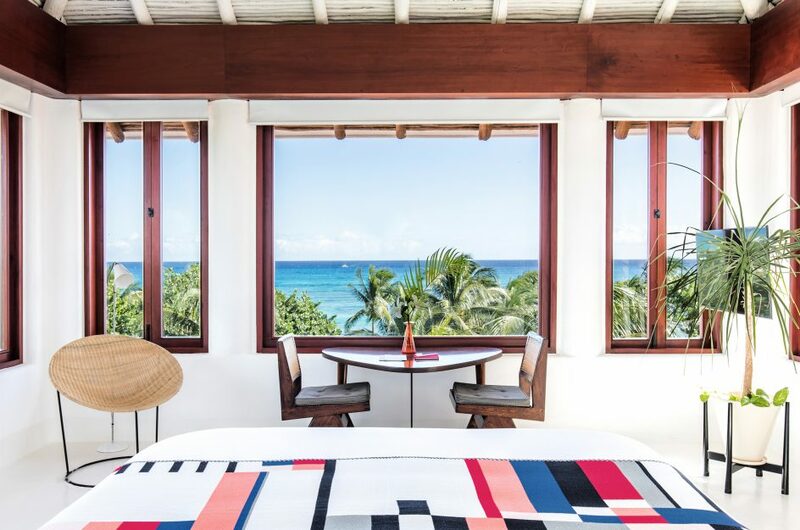 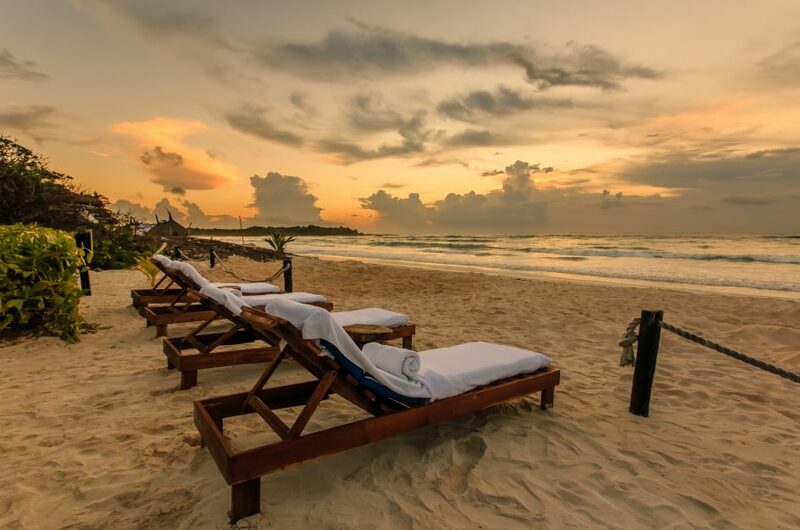 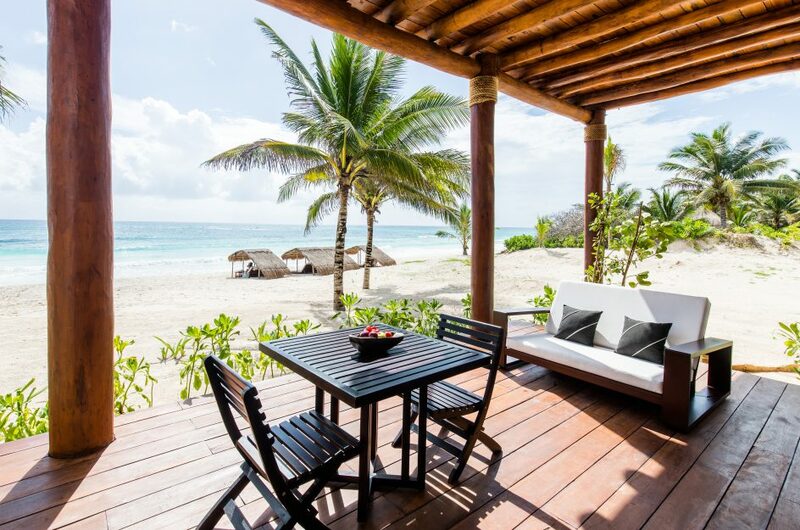 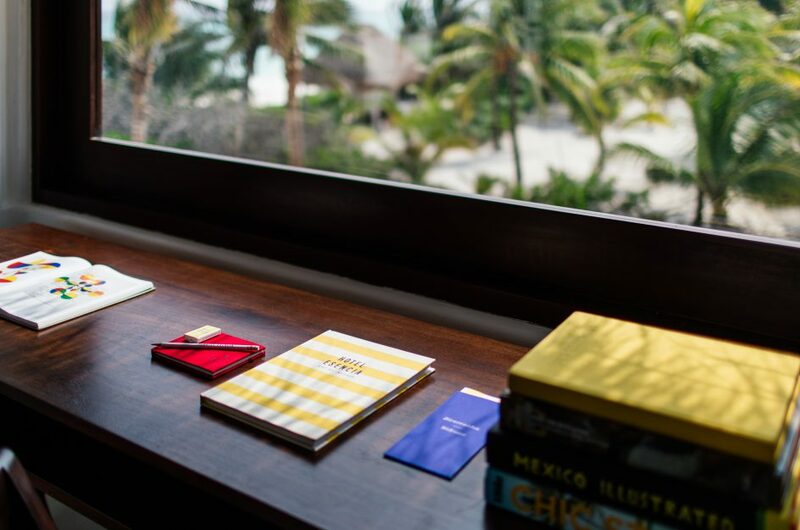 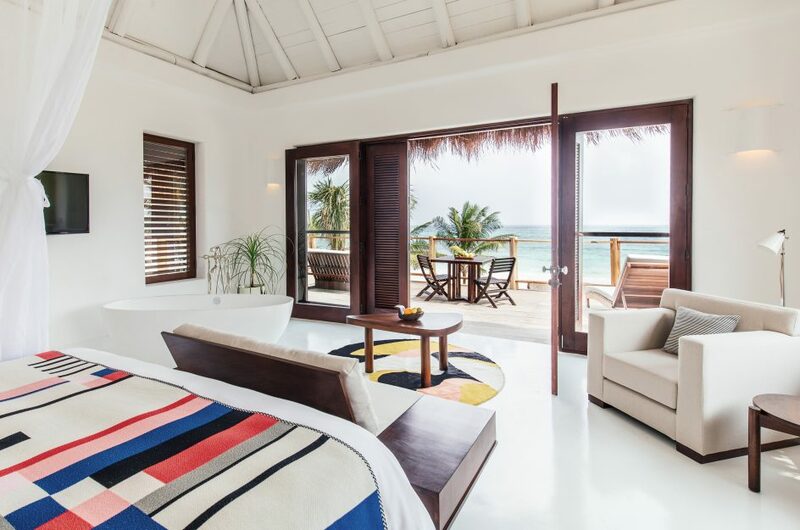 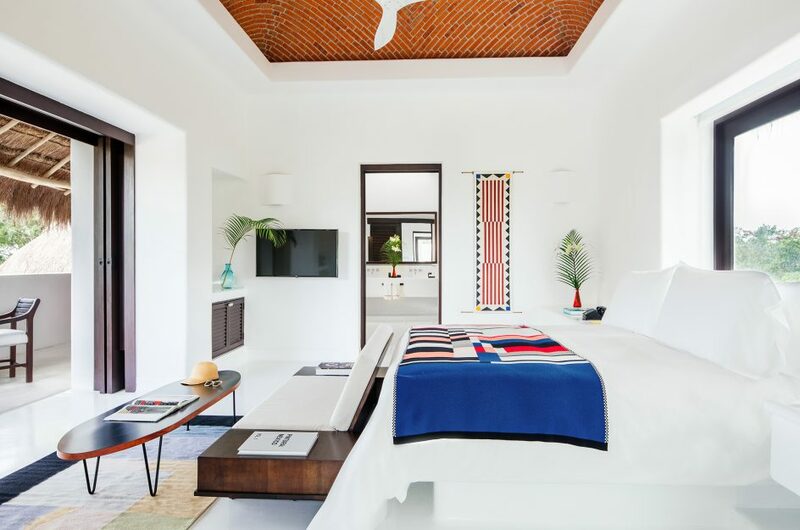 Each new Beach Suite features a private beachfront terrace, an in-room double bathtub, and all of Hotel Esencia’s signature amenities. 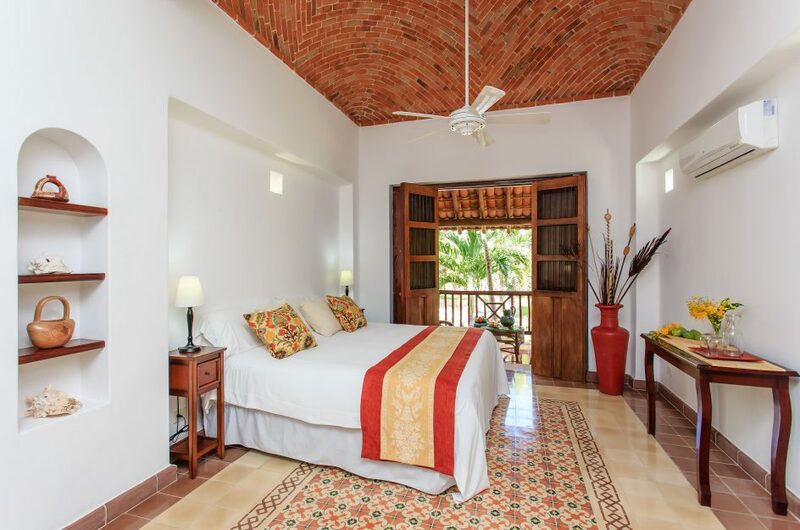 All accommodations at Hotel Esencia feature walk-in closets, large screen high definition televisions, and an in-room sound system with hookup for iPods and other digital accessories. 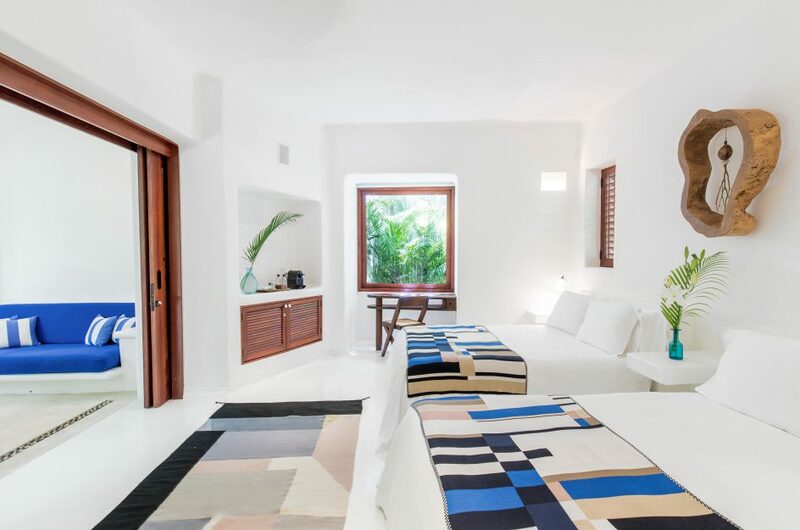 Each of our two spectacular Master Beach Suites is designed with an eye toward maximum privacy, comfort, and independence. 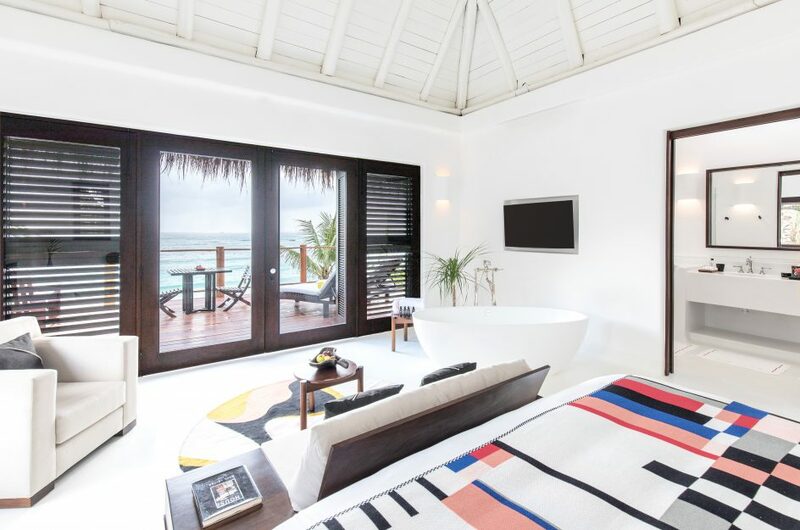 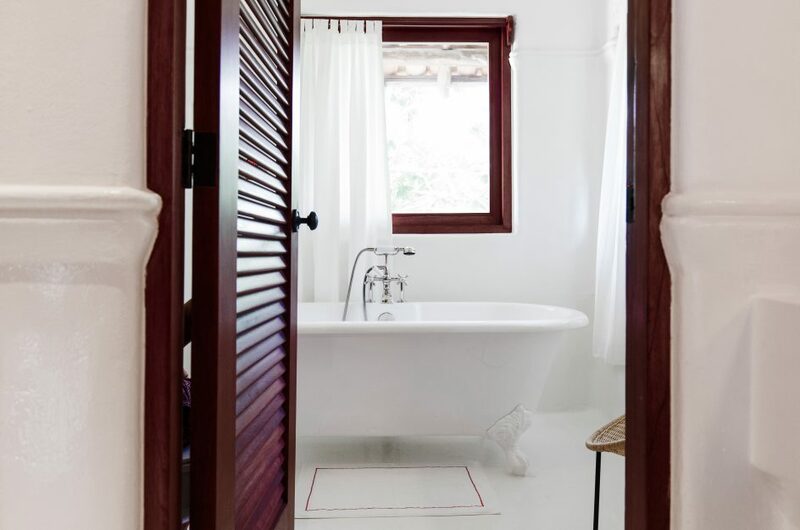 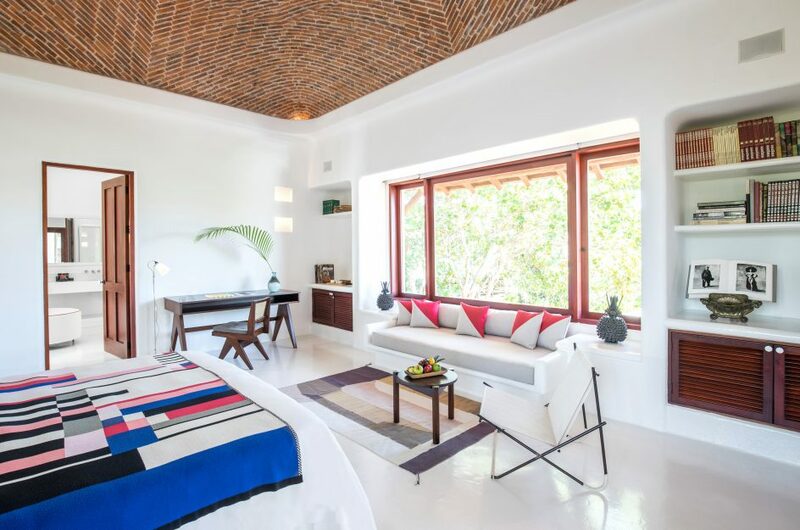 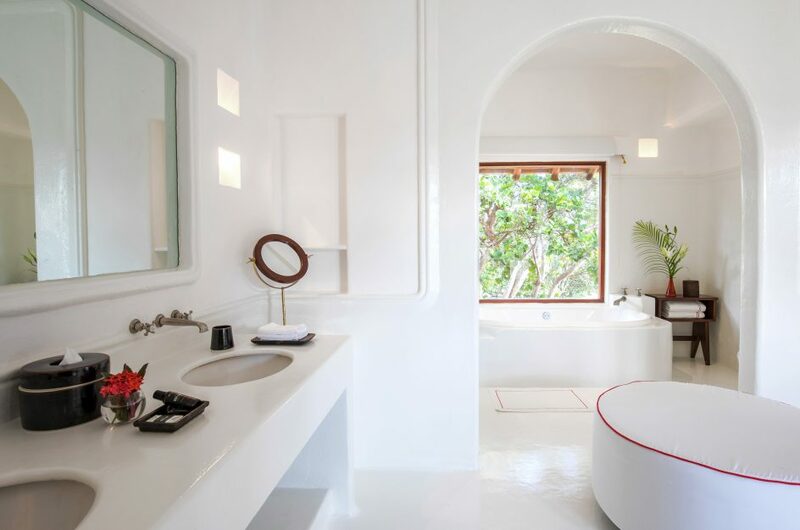 With windows on three sides, and extremely spacious bathrooms with love seats, these suites also include a private heated plunge pool. 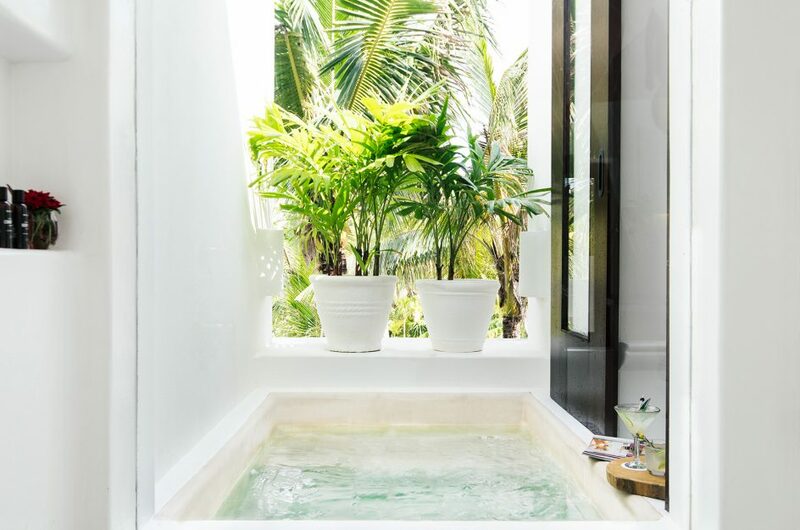 The ground level Master Beach Suite features an outdoor plunge pool surrounded by a terrace with built-in seating, while the upper level suite features an extremely private heated plunge pool next to the double walk-in shower. 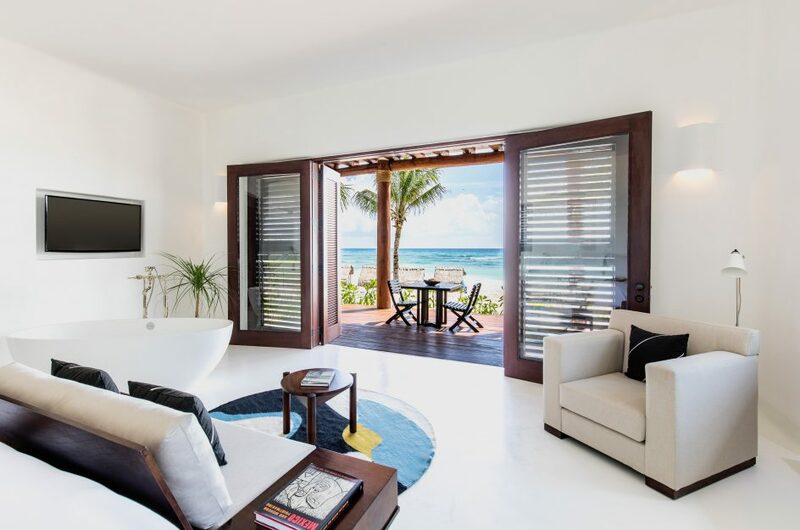 The main house’s Ocean Suite offers stately seclusion only steps from the hotel’s beating heart. 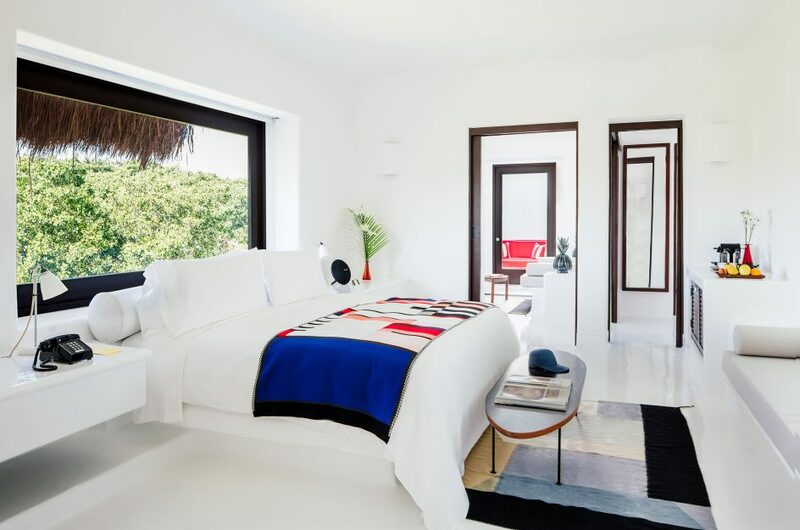 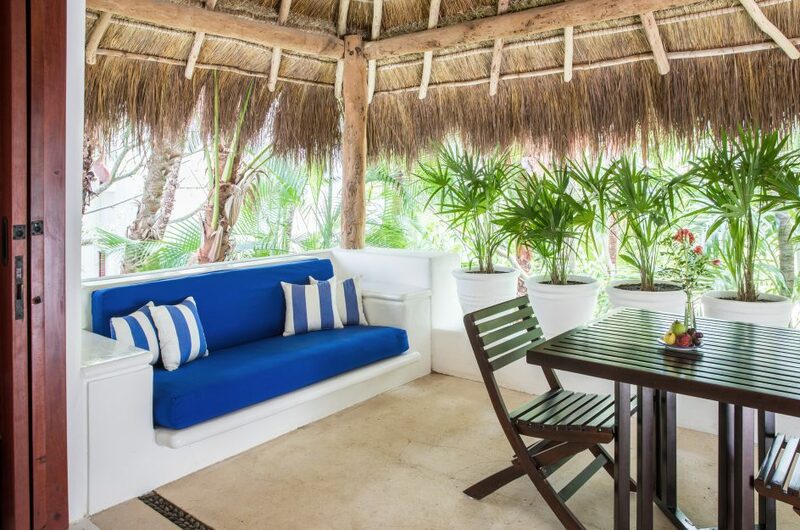 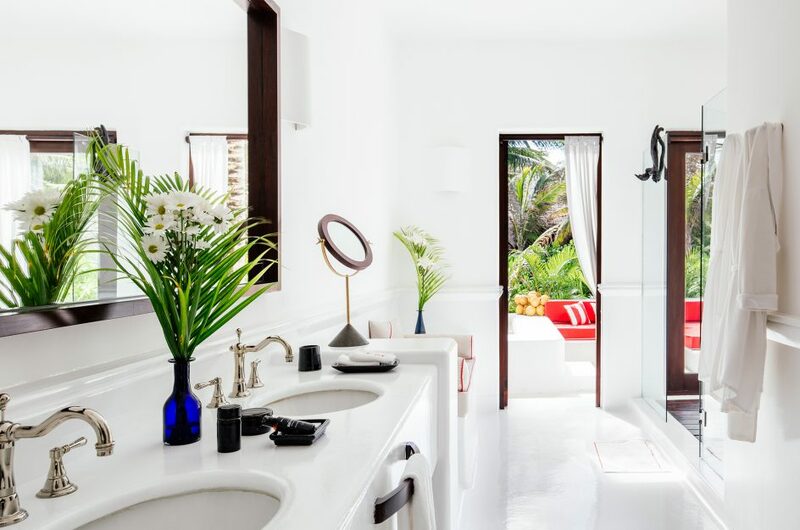 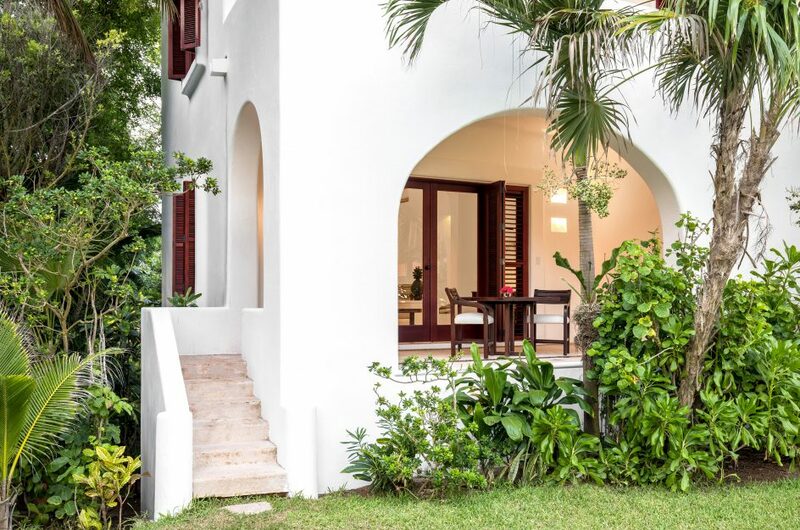 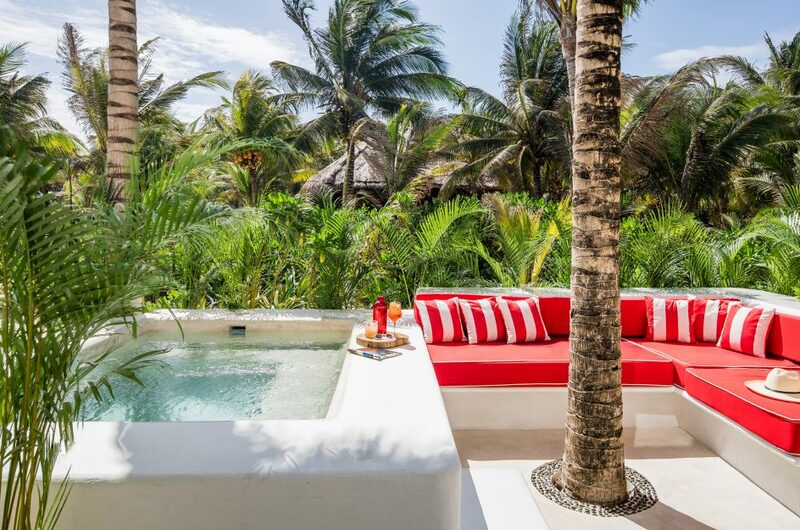 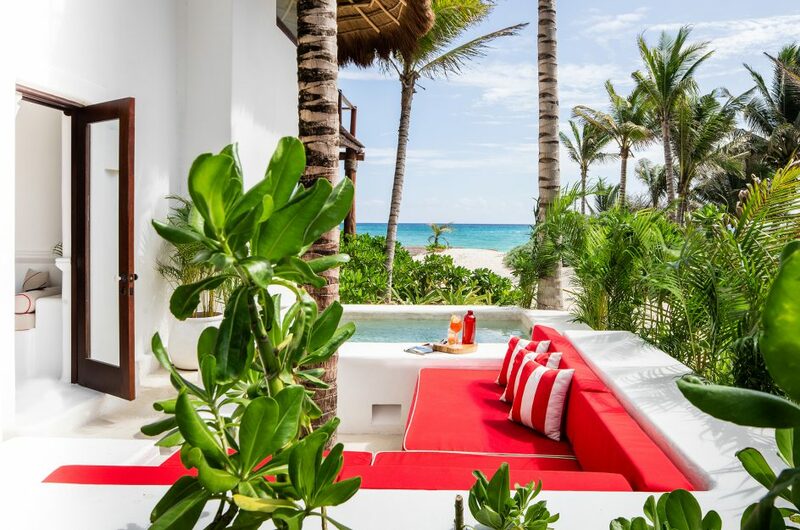 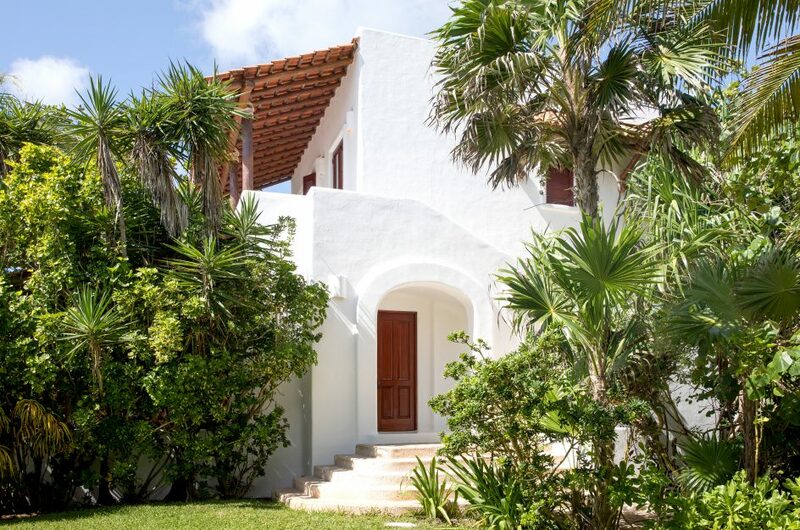 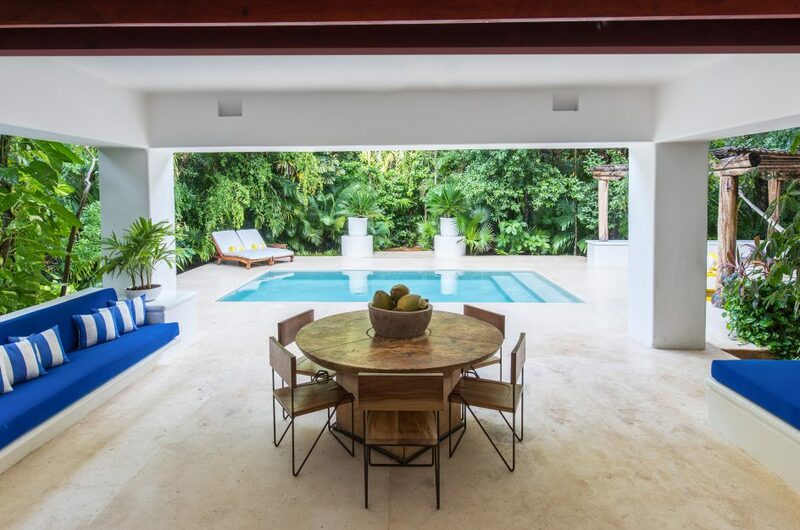 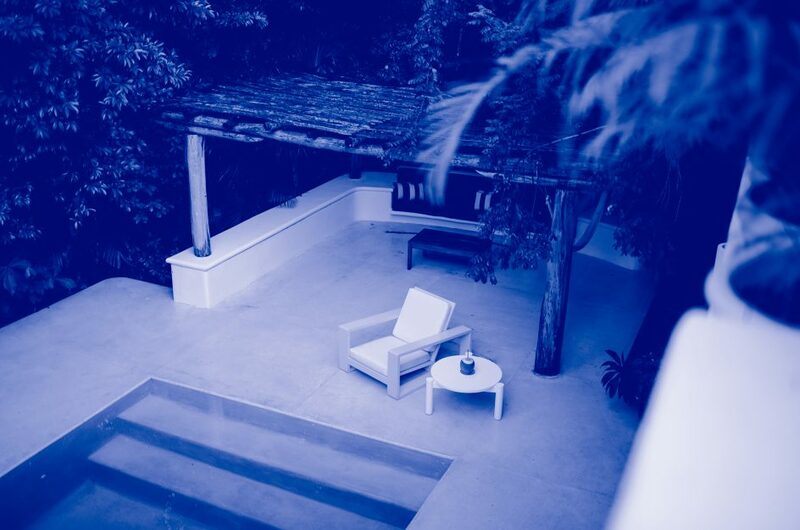 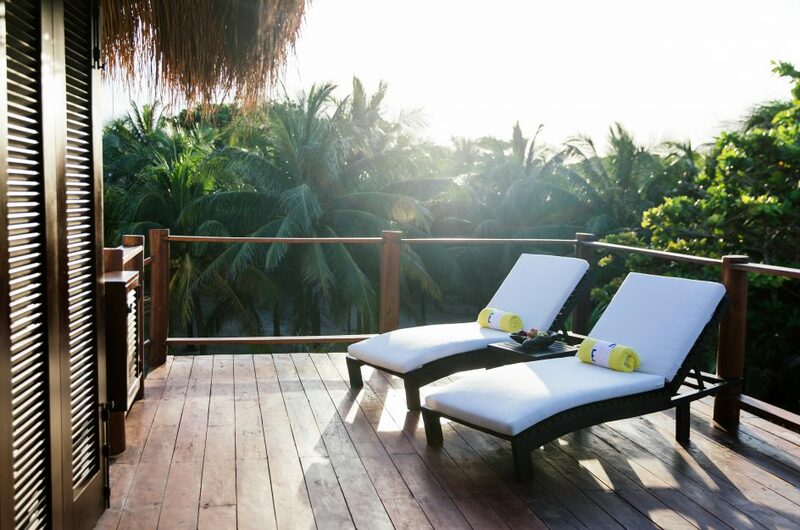 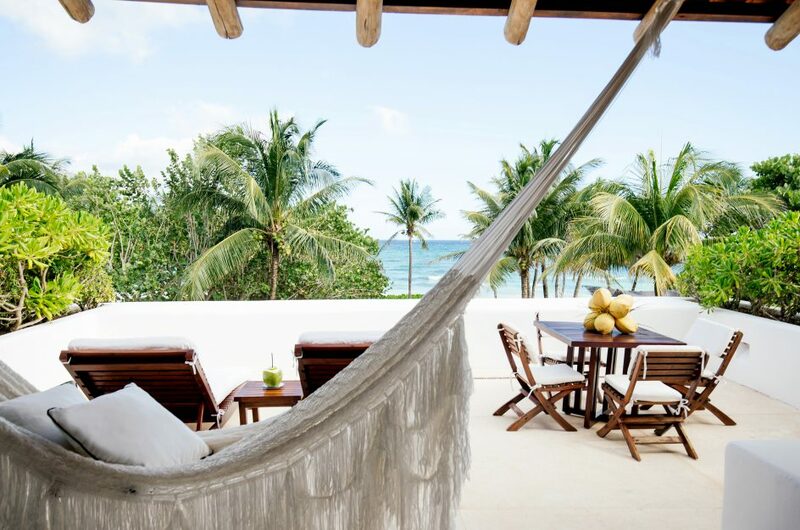 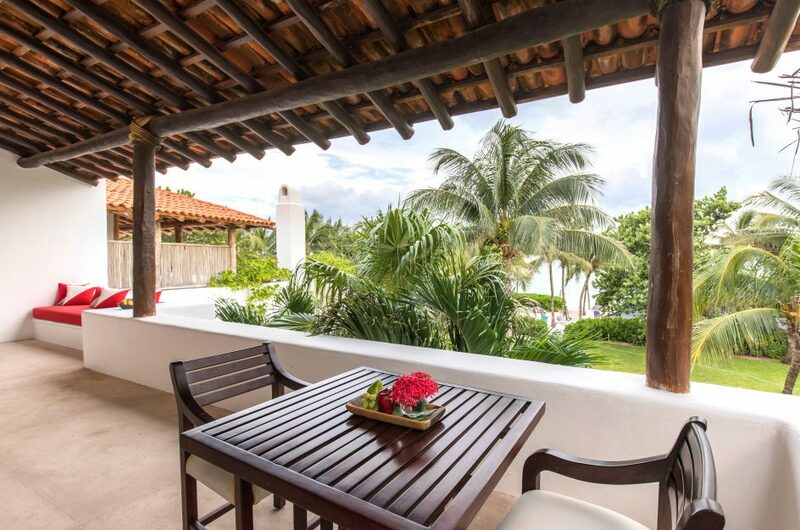 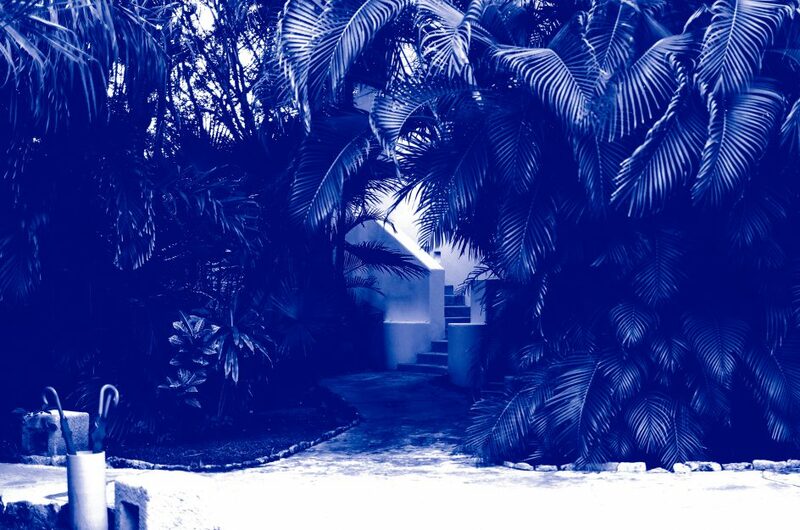 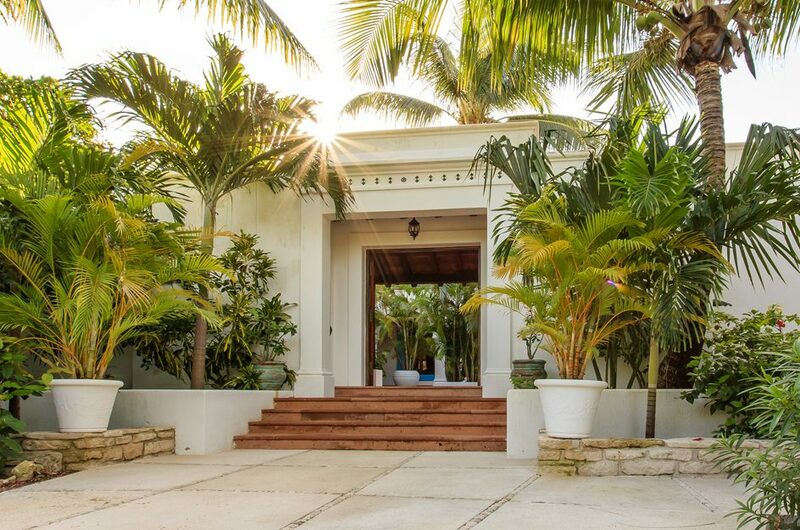 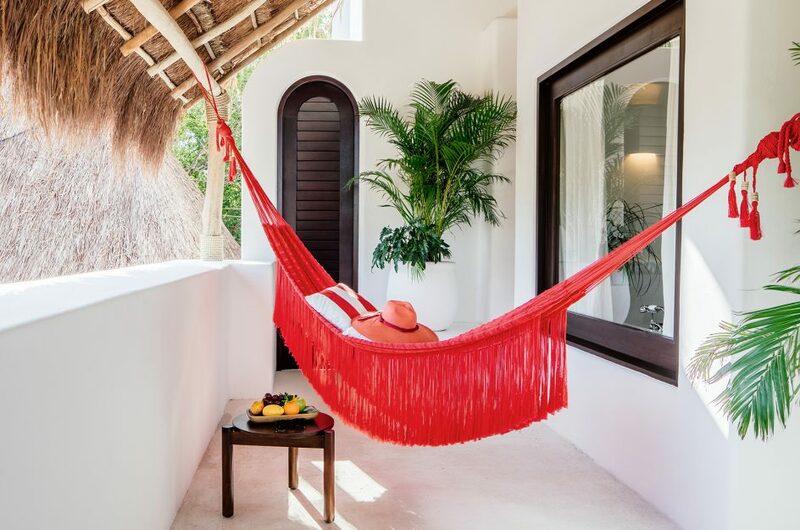 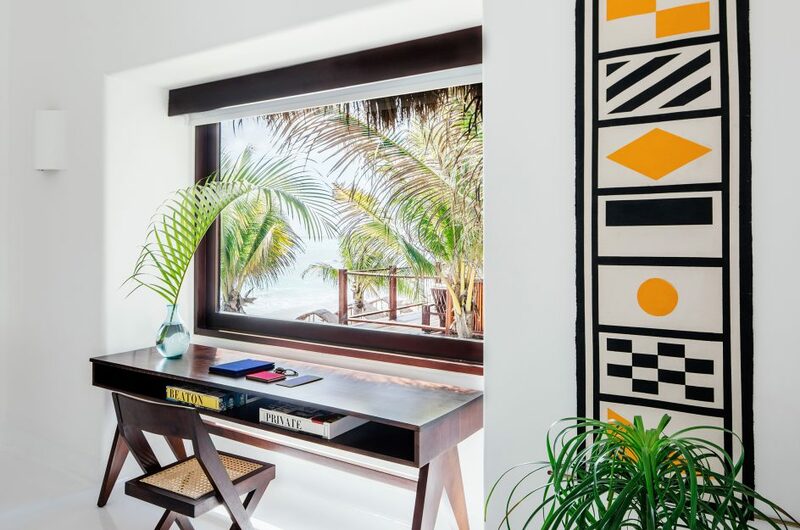 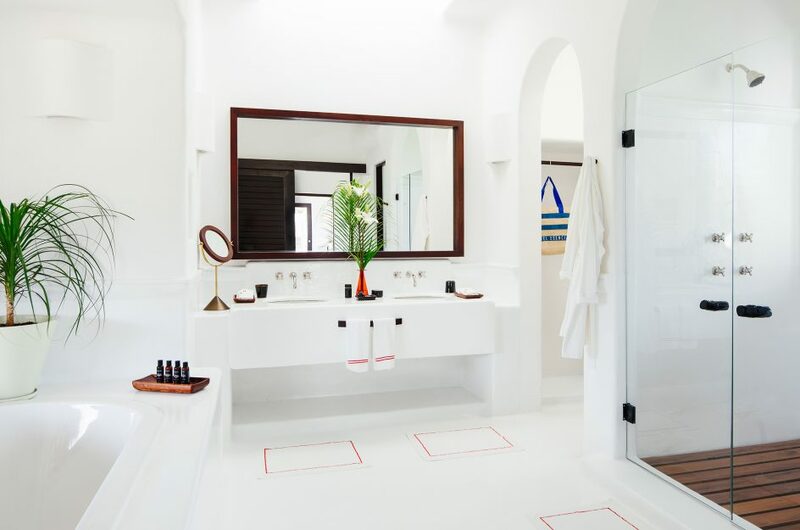 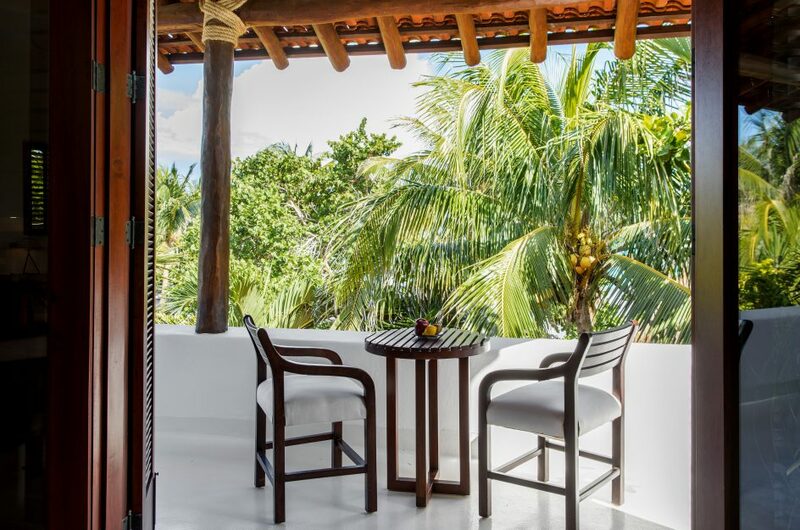 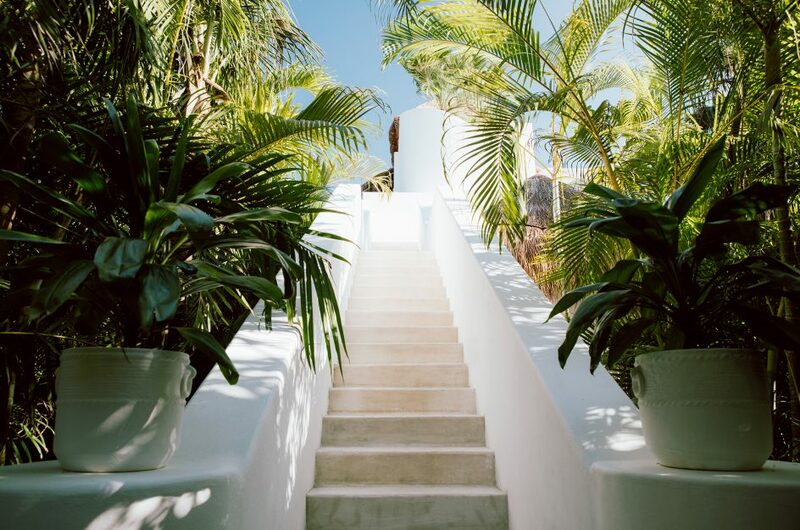 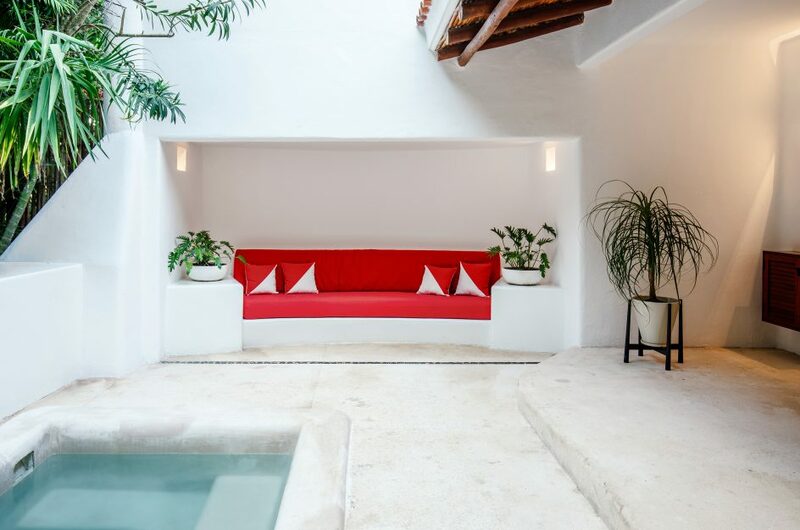 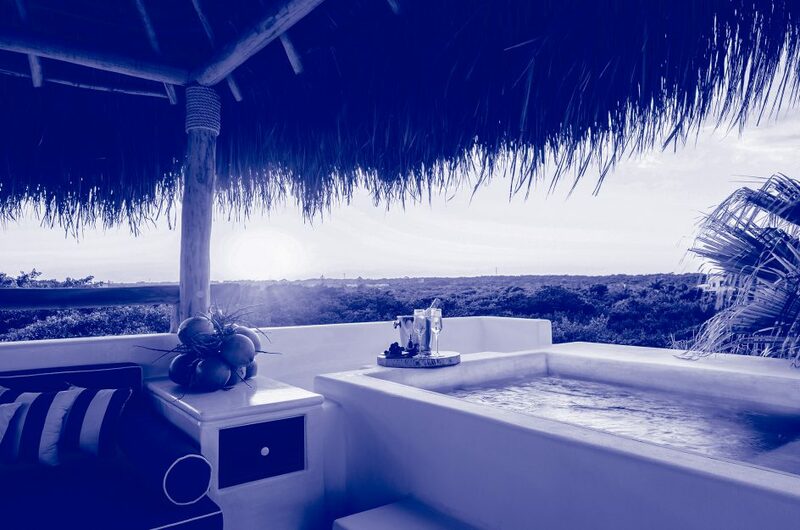 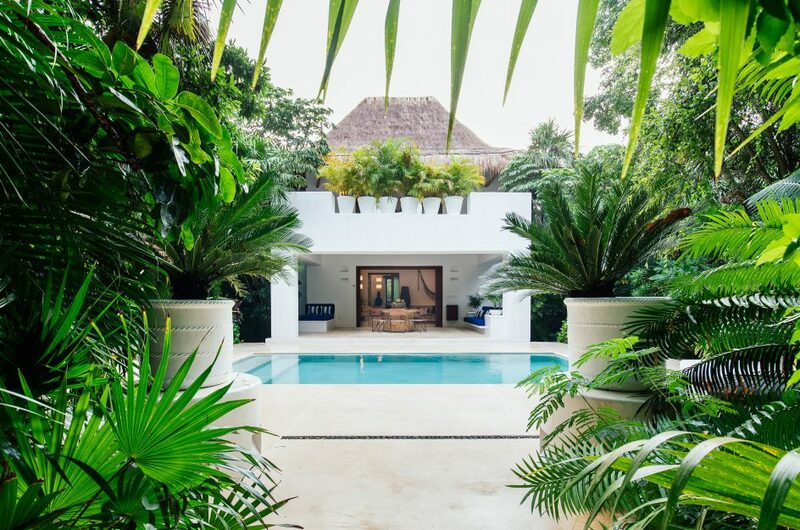 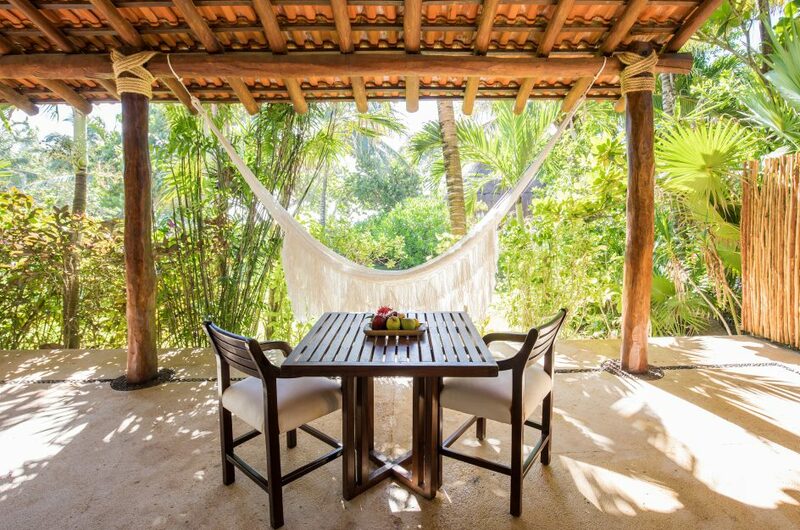 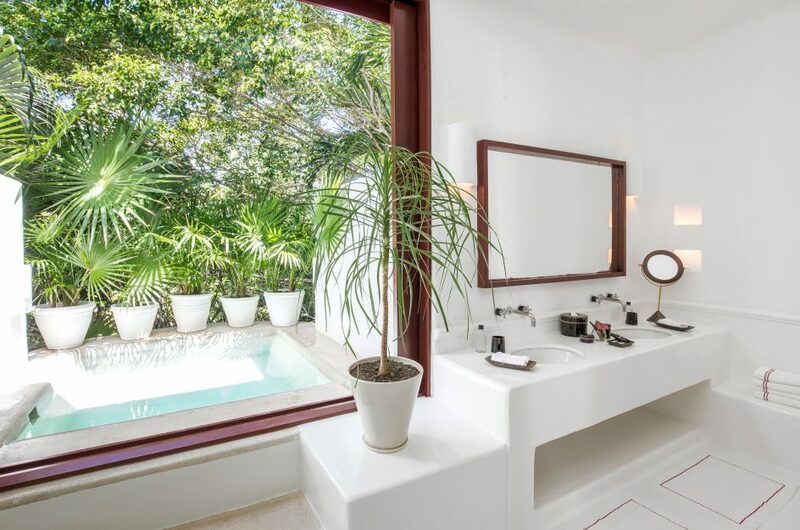 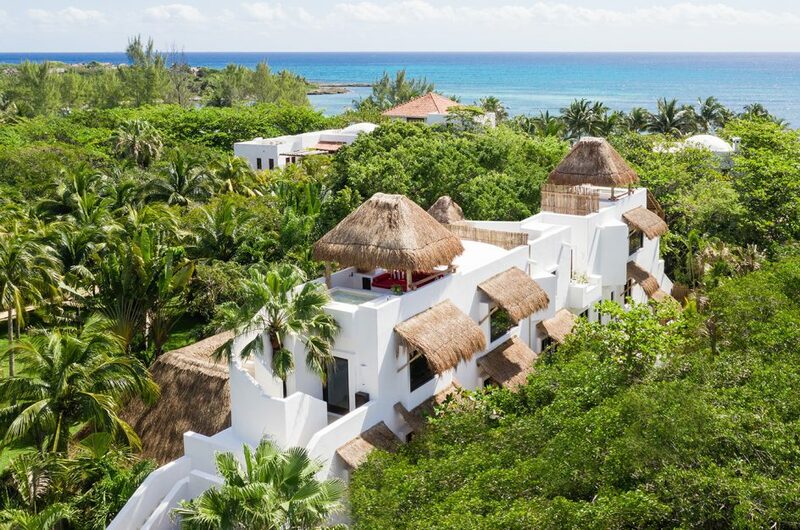 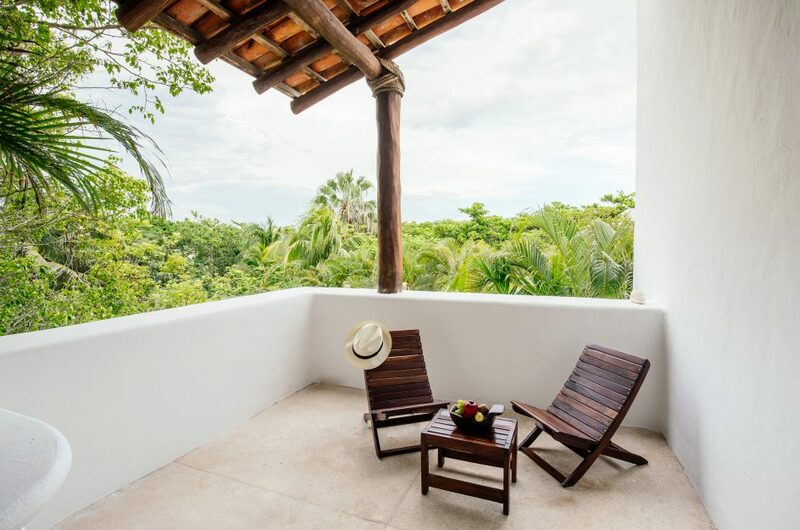 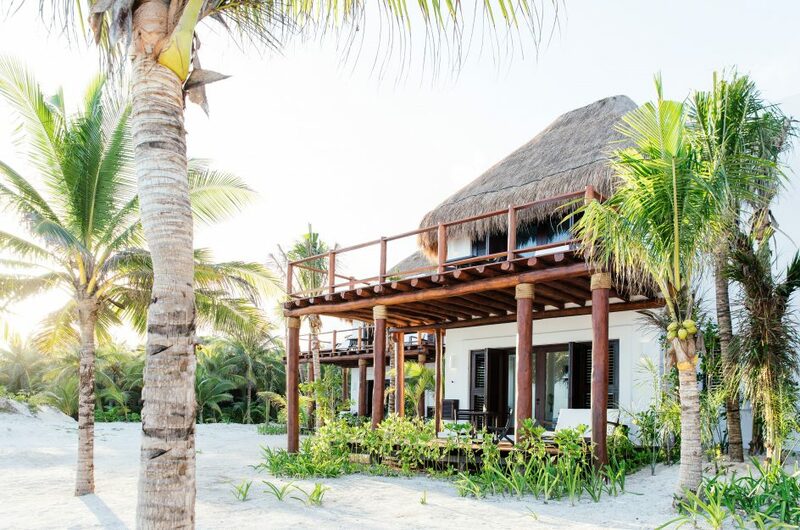 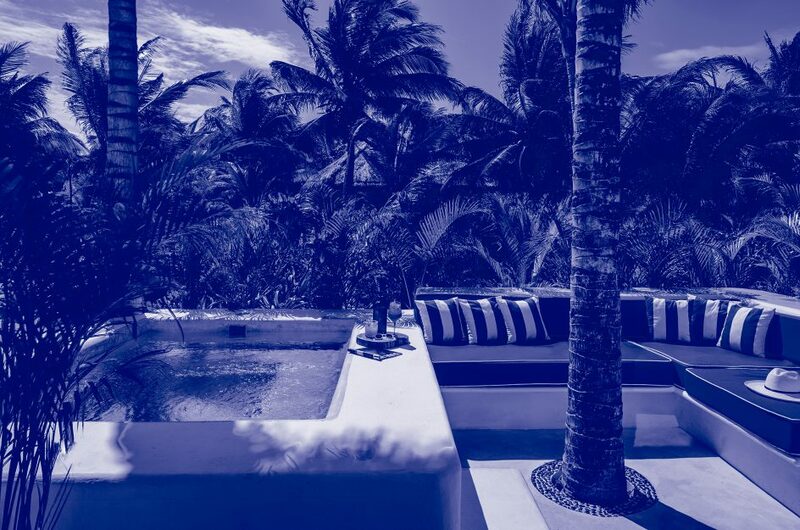 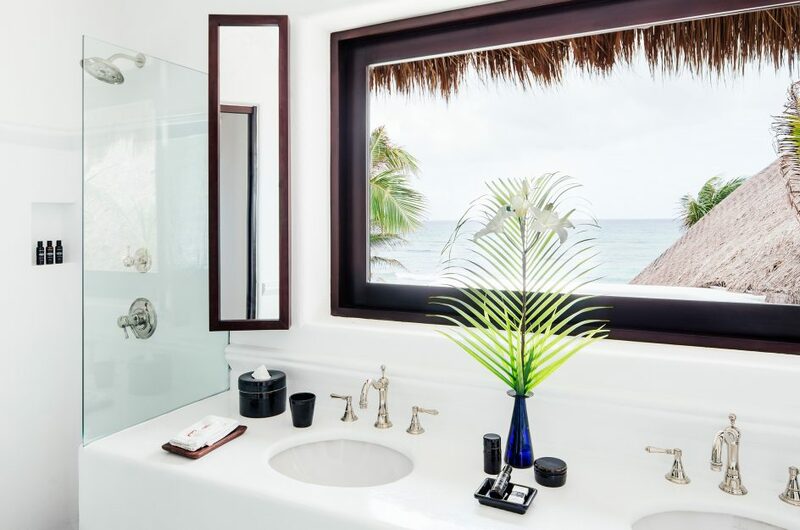 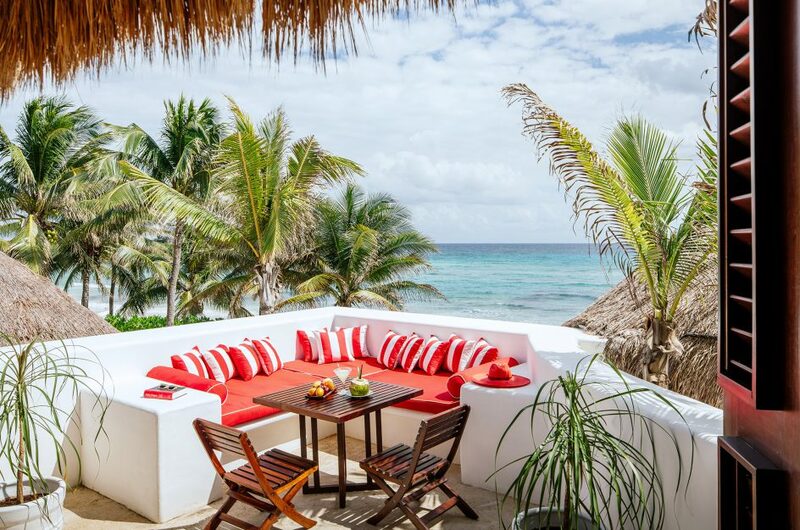 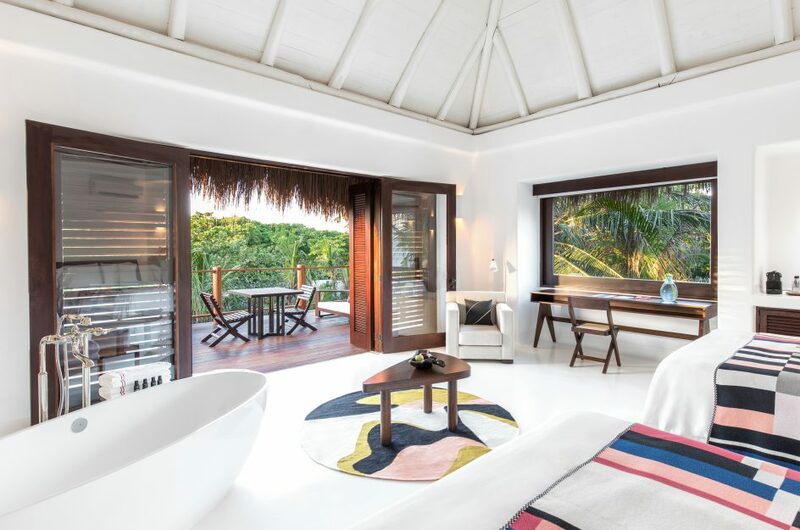 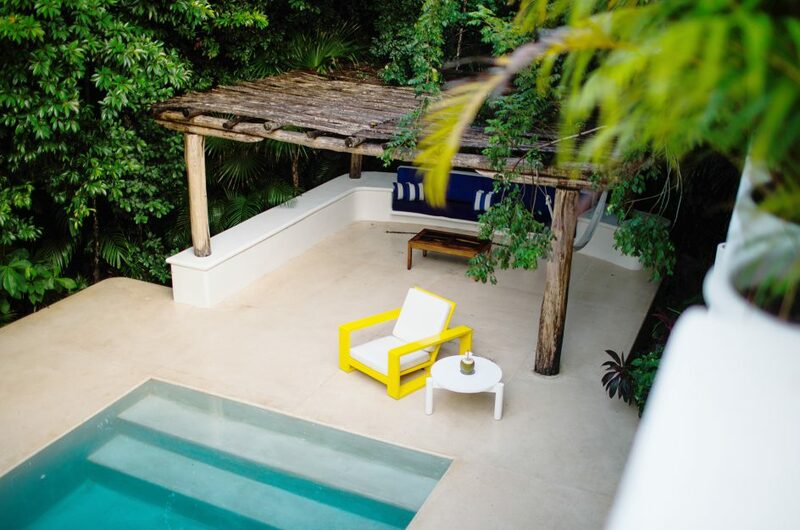 A large private terrace surveys the pools with peekaboo sea views through the lush foliage between the main house and Xpu-ha cove, while an airy seating area, spacious bathroom, and all of Hotel Esencia’s signature amenities come together as a proper home away from home. 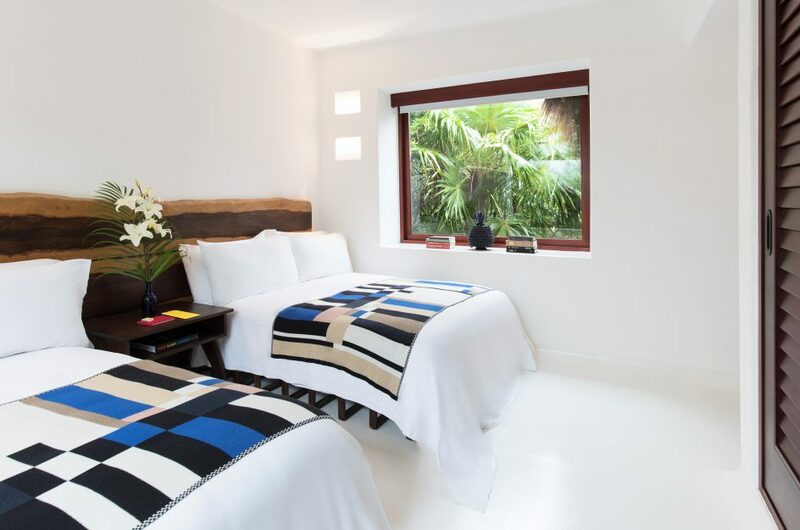 All accommodations at Hotel Esencia feature walk-in closets, large screen high definition televisions, and an in-room sound system with hookup for iPods and other digital accessories. 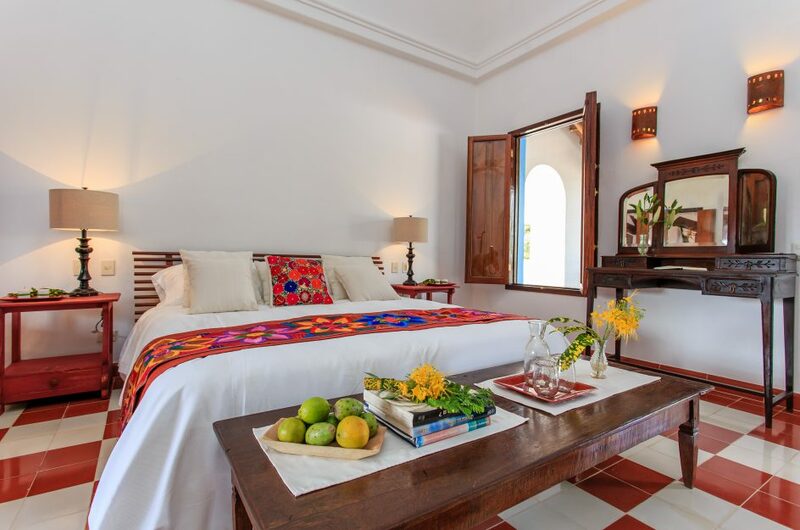 The images shown are representative of the room category however each room in the main house is individually decorated and no two rooms are alike. 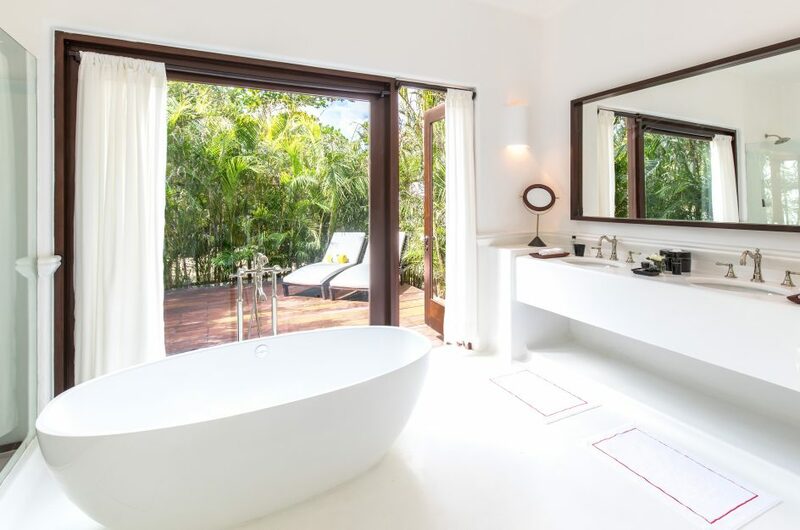 Some are on the ground floor with a large terrace and some are on an upper floor with balcony; some have a plunge pool and some have a bathtub while others, though more spacious, have neither. 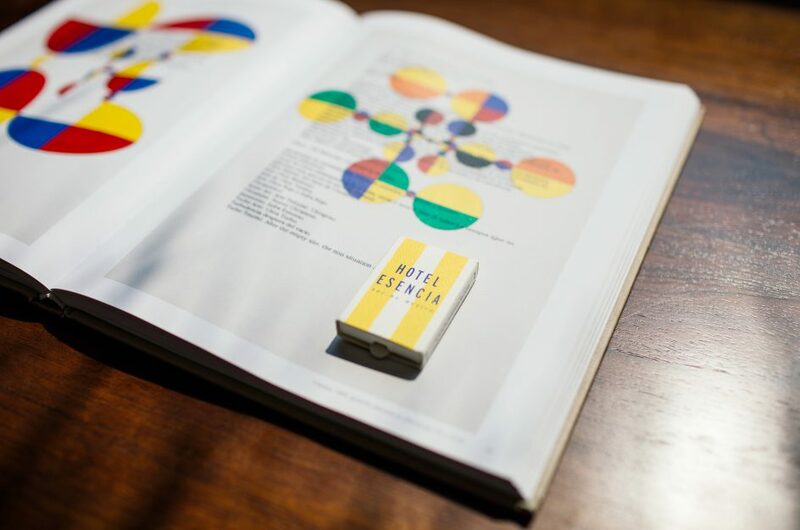 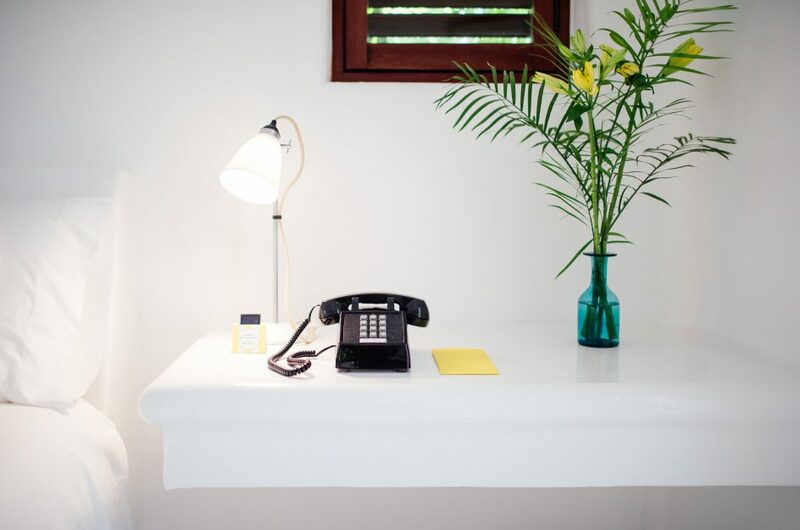 Please be sure to consult with our reservations team to ensure the in-room features of your choice. 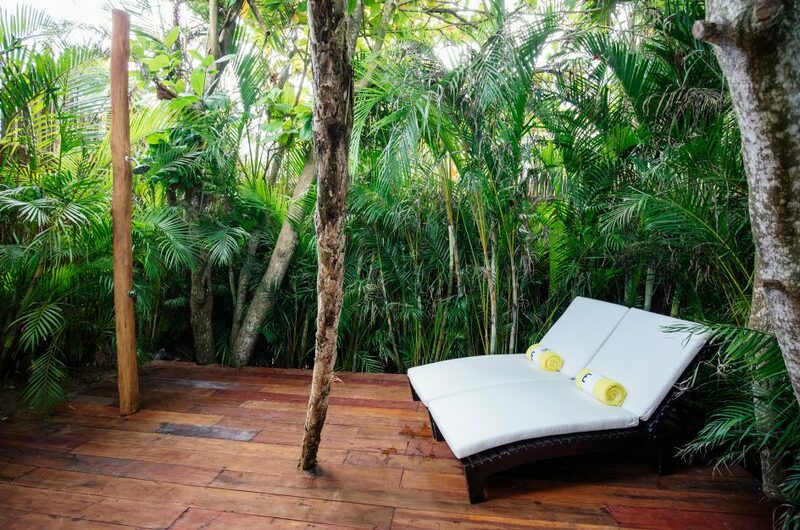 A plunge pool, rain-like shower room, and spacious outdoor dining terrace with sofa distinguish every Jungle Suite with Plunge Pool as uniquely equipped for calm and restoration. 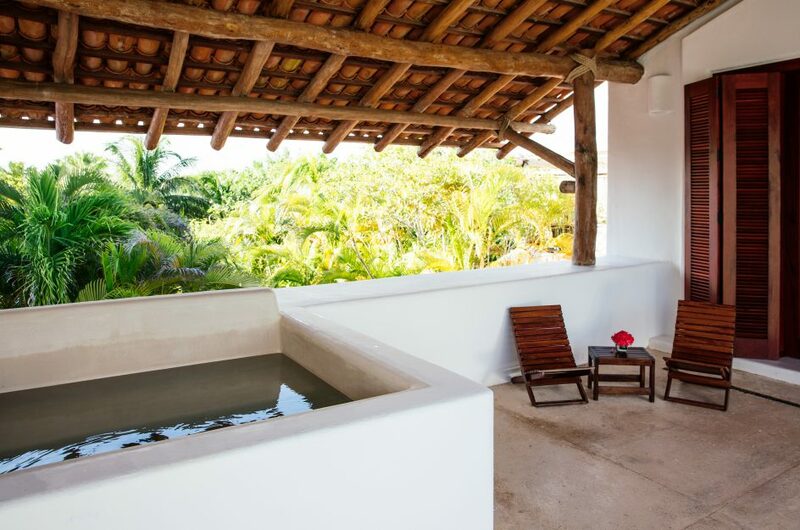 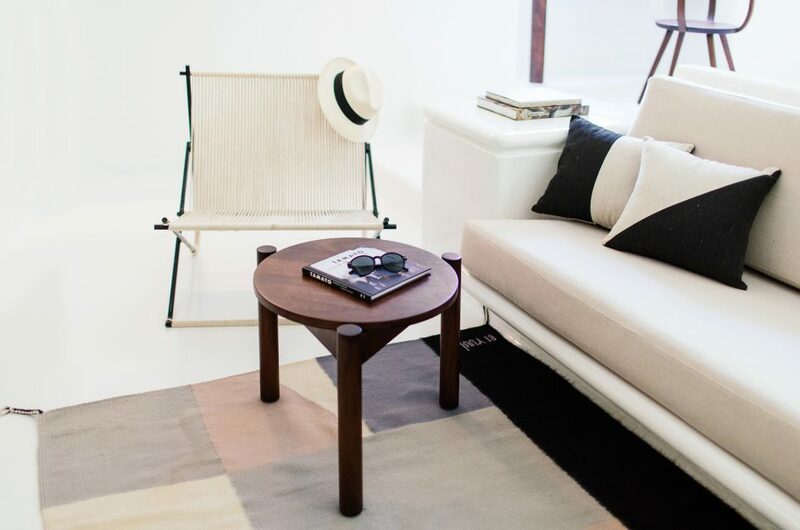 Some suites include an indoor plunge pool and some feature an outdoor plunge pool within a terrace solarium. 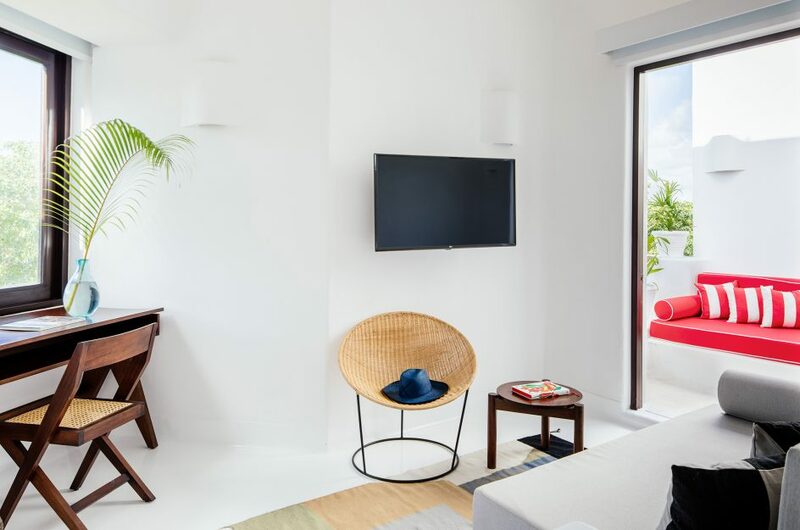 All suites in this category feature spacious bathrooms including large bathtubs, walk-in closets, high definition televisions, and an in-room sound system with hookup for iPods and other digital accessories. 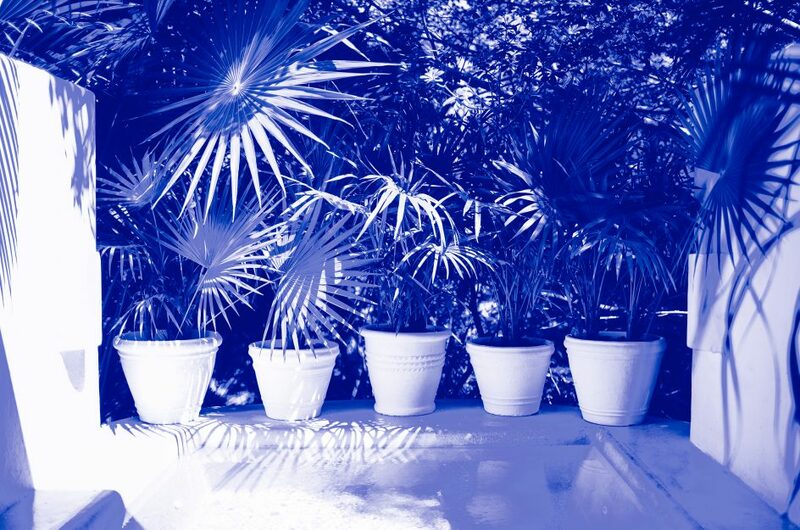 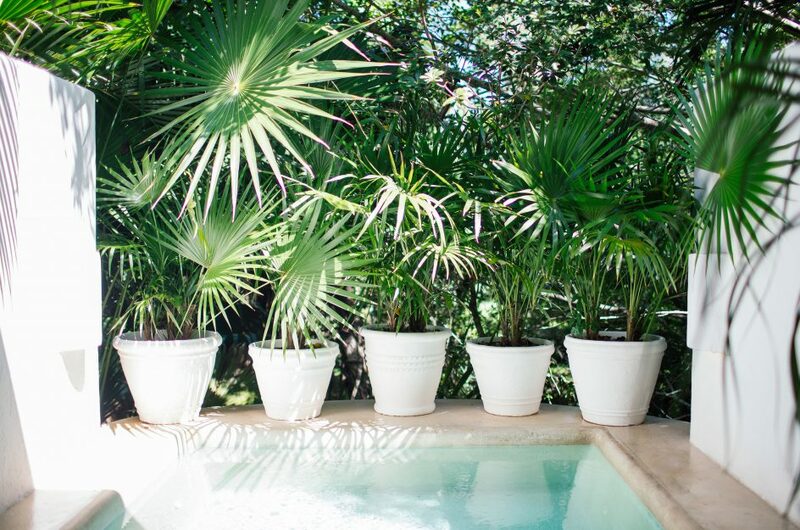 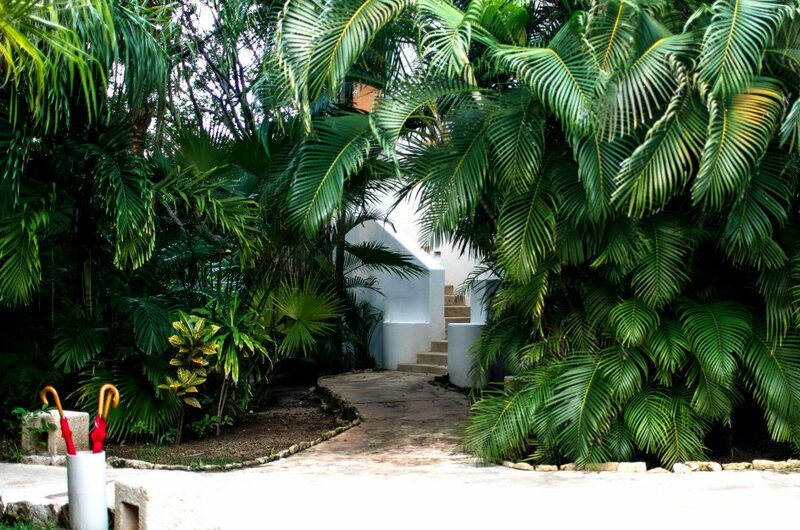 Jungle Suites are quiet, cooling sanctuaries that encircle the estate’s tropical gardens. 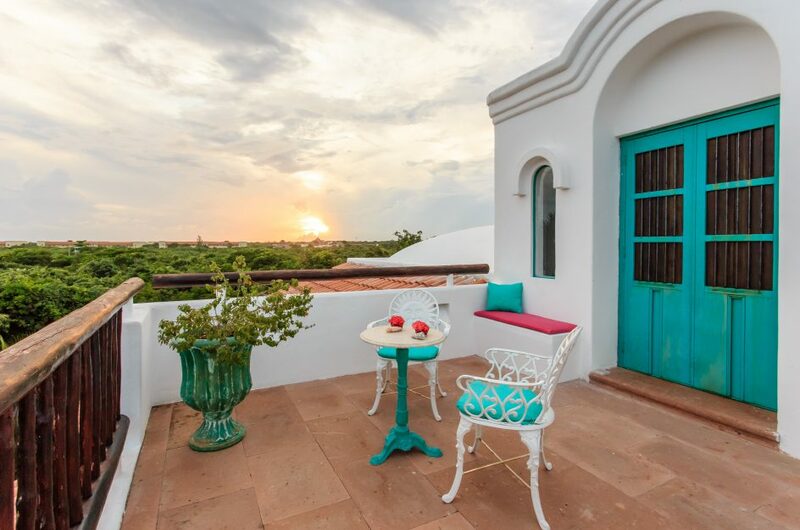 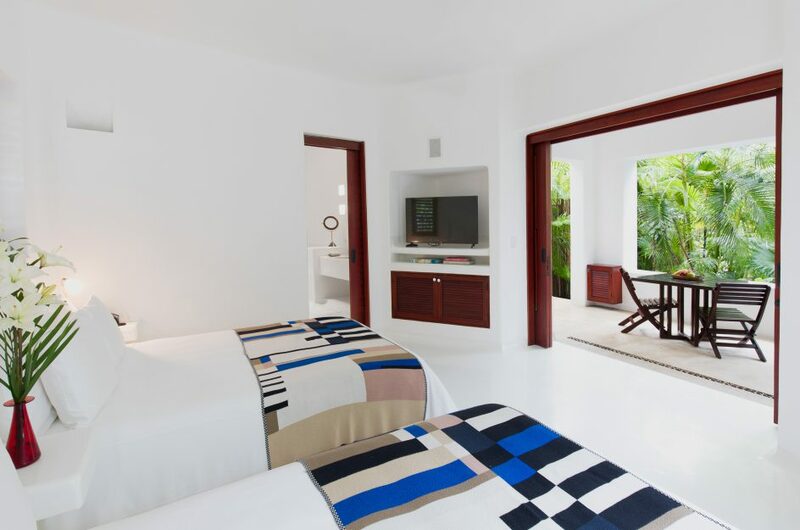 Available with one king or two queen beds, these suites have a large private outdoor terrace with seating area. 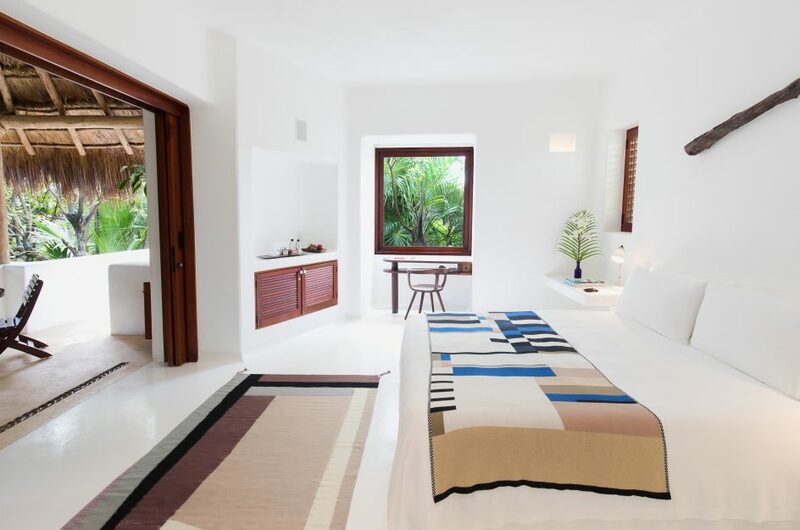 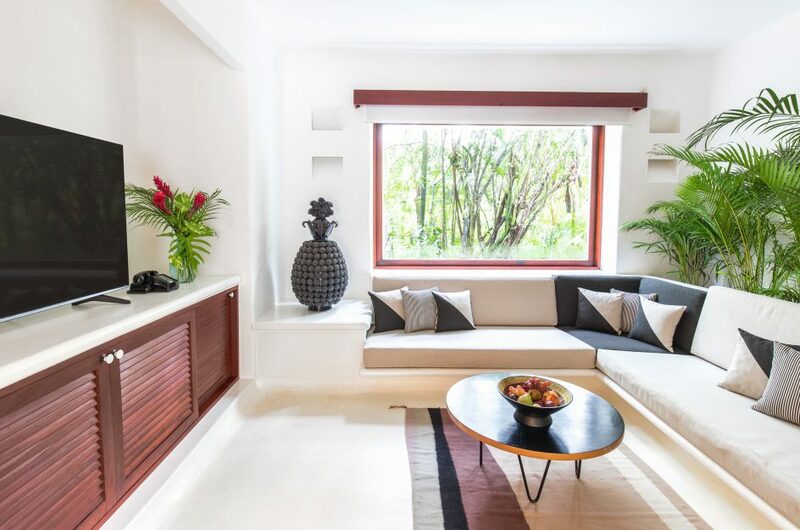 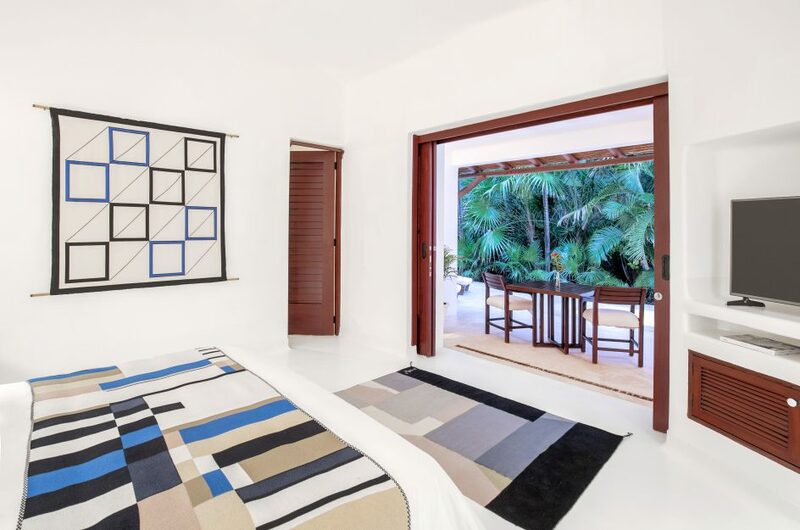 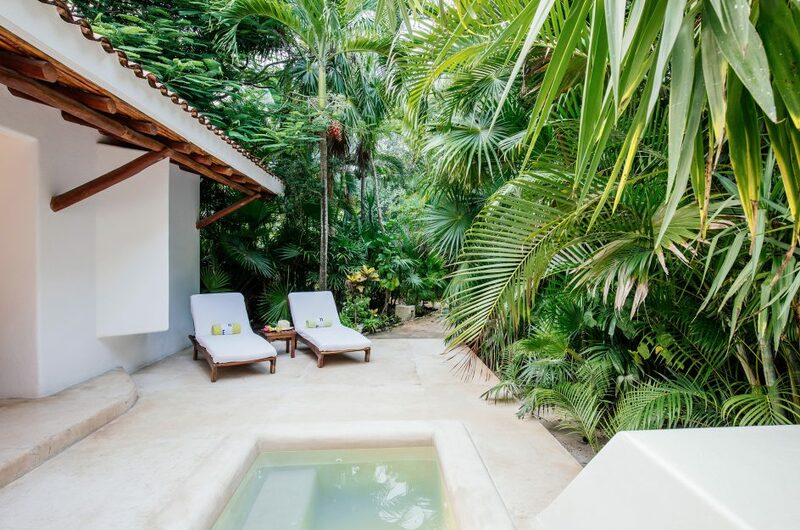 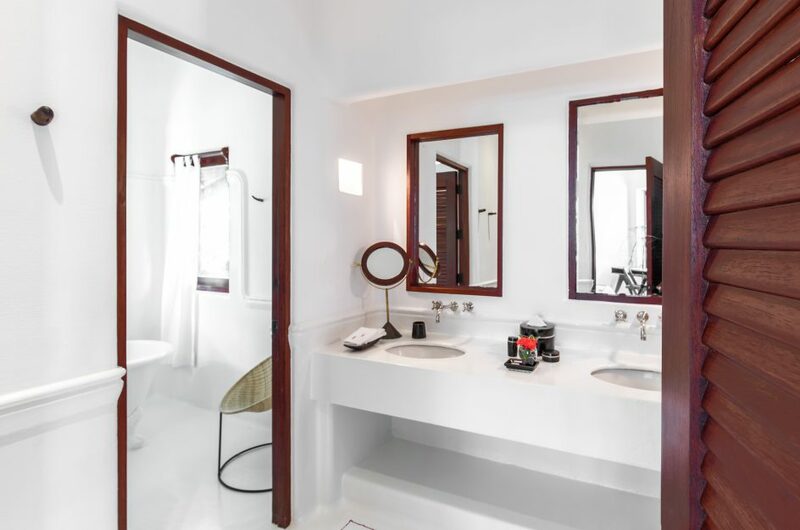 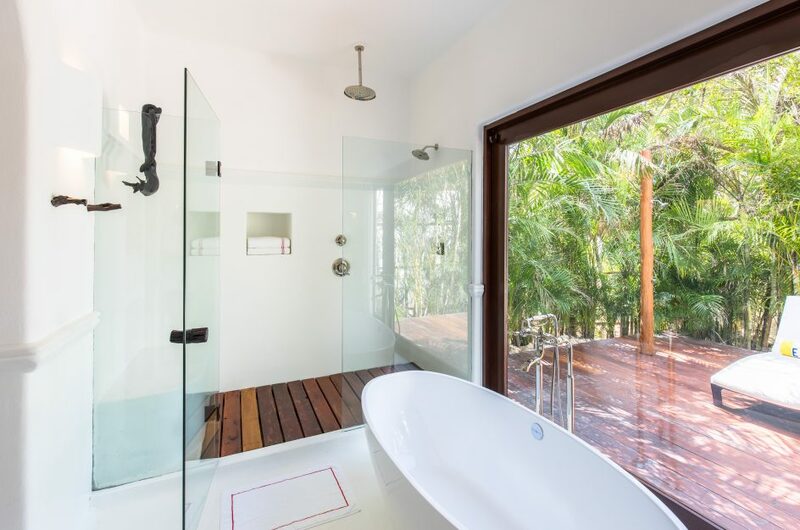 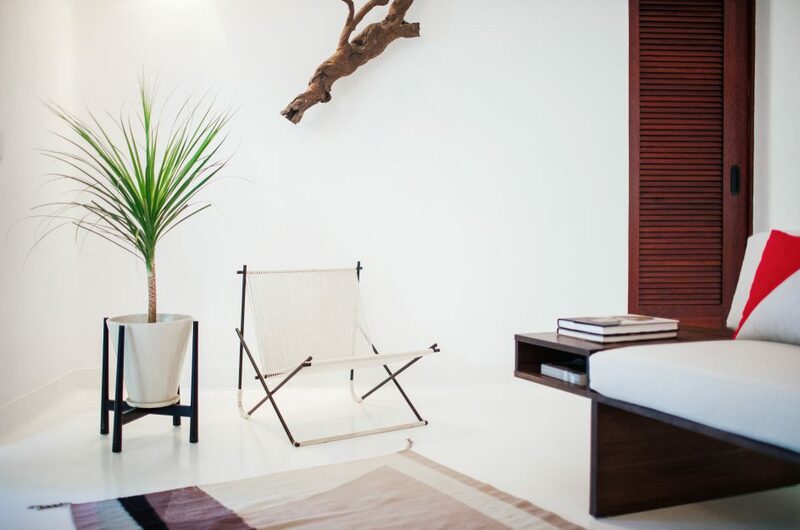 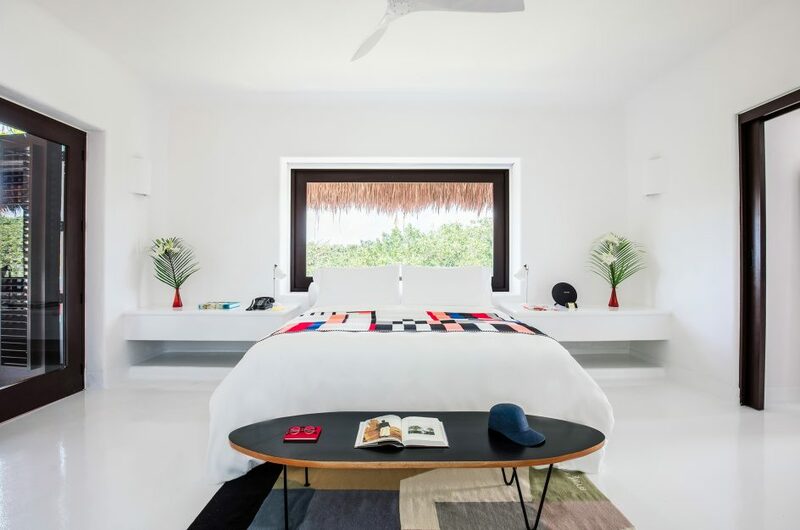 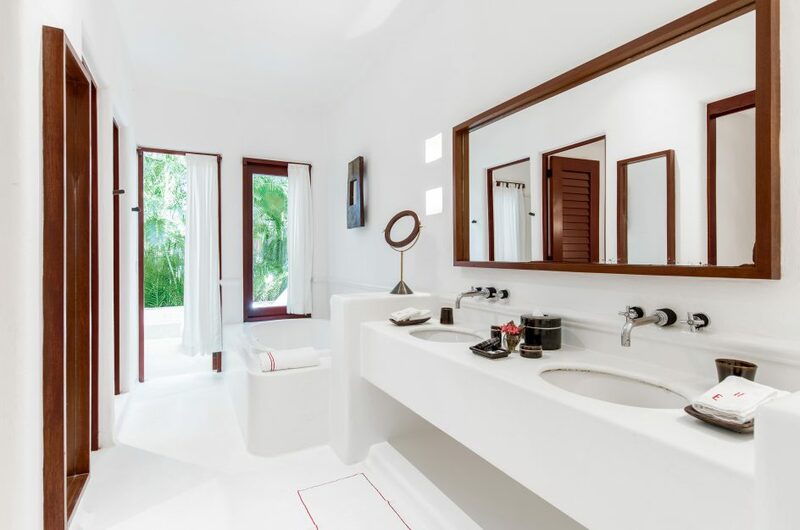 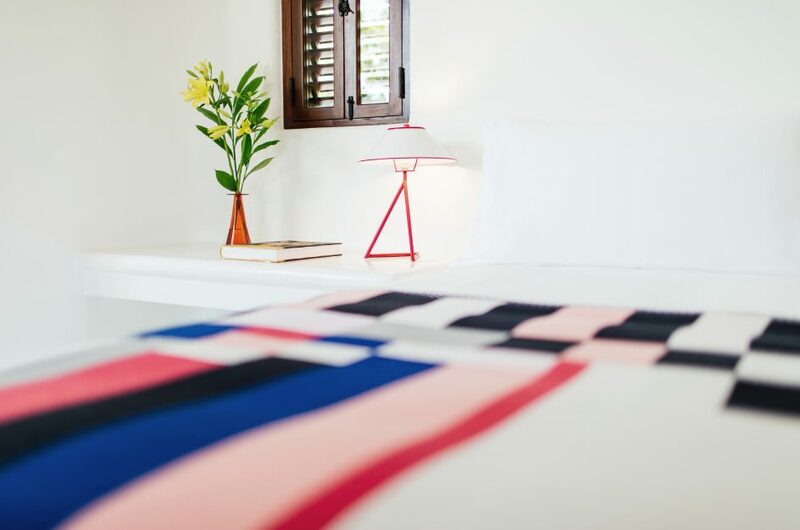 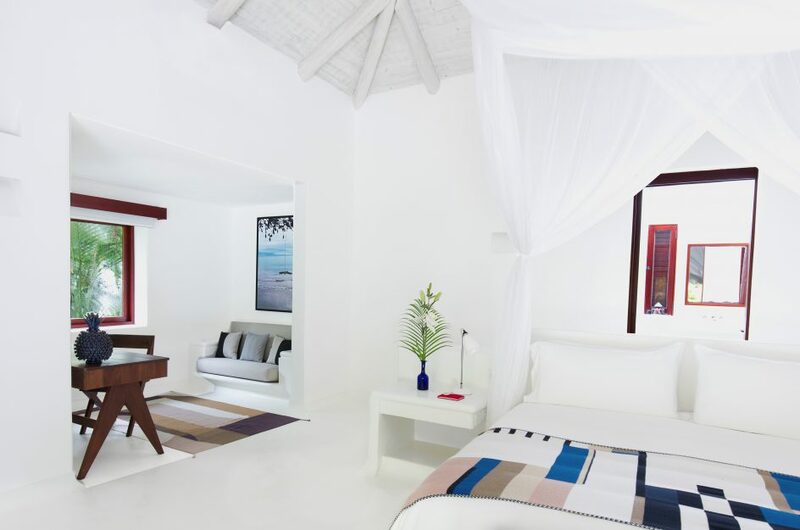 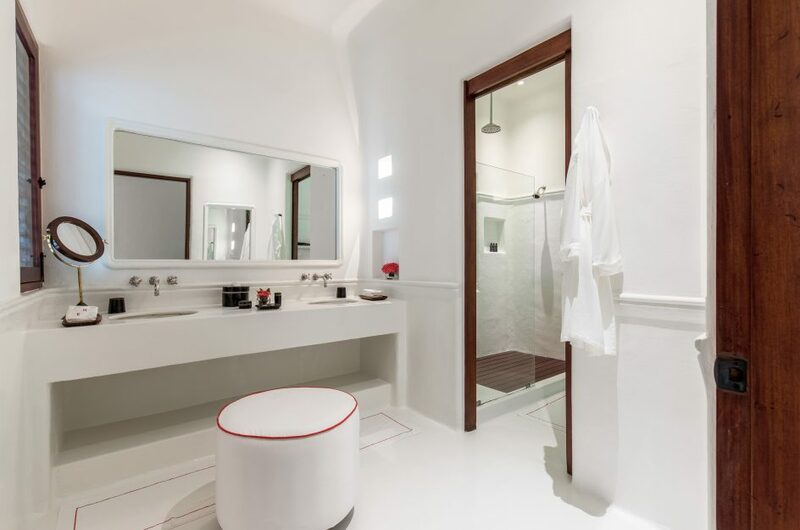 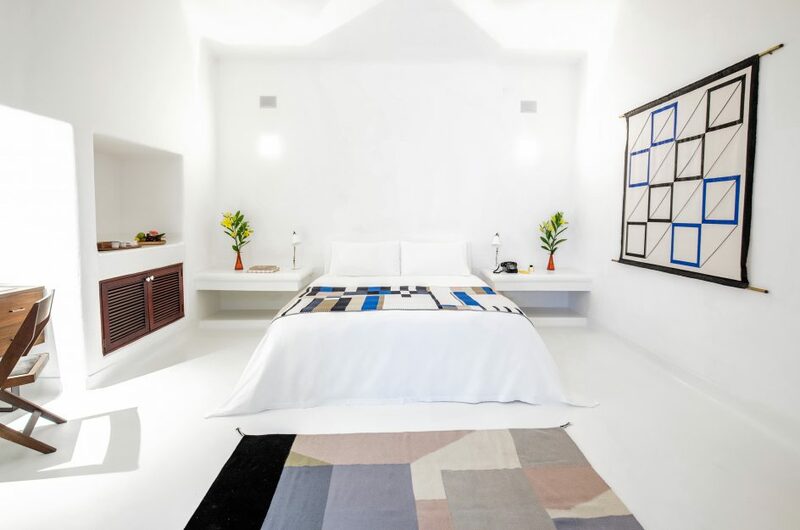 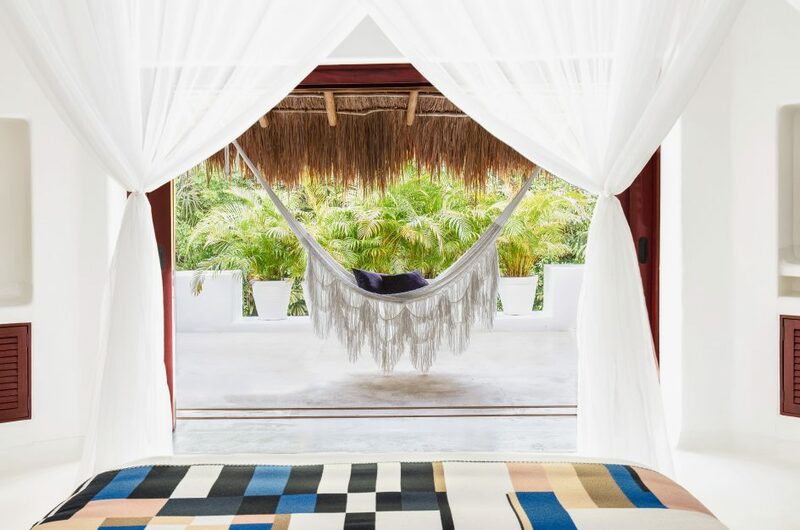 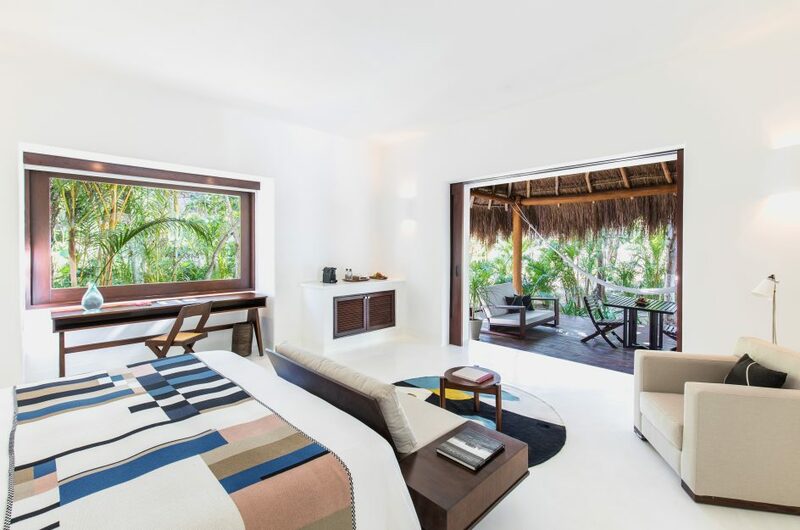 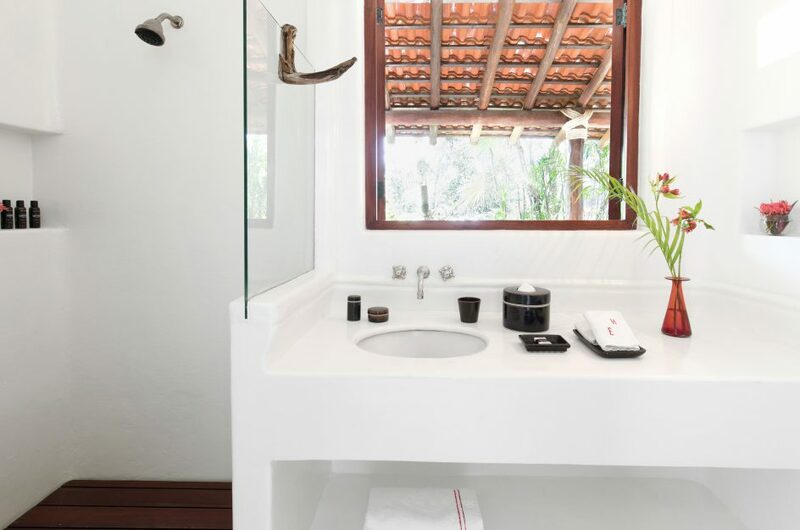 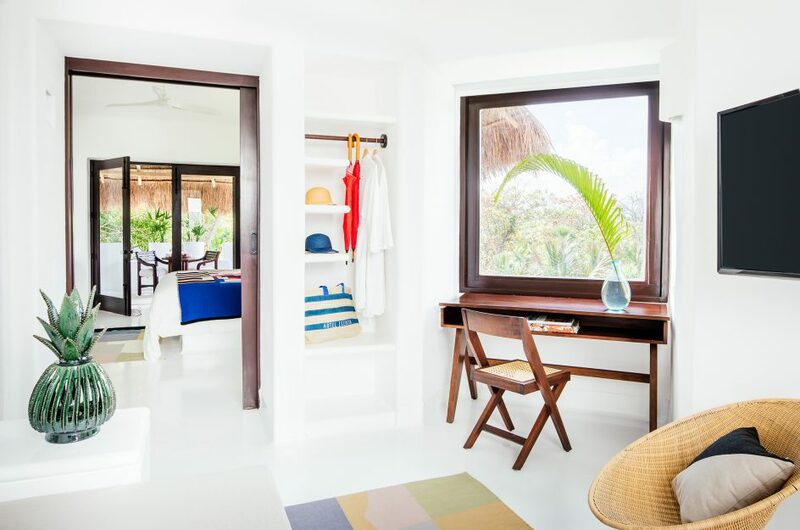 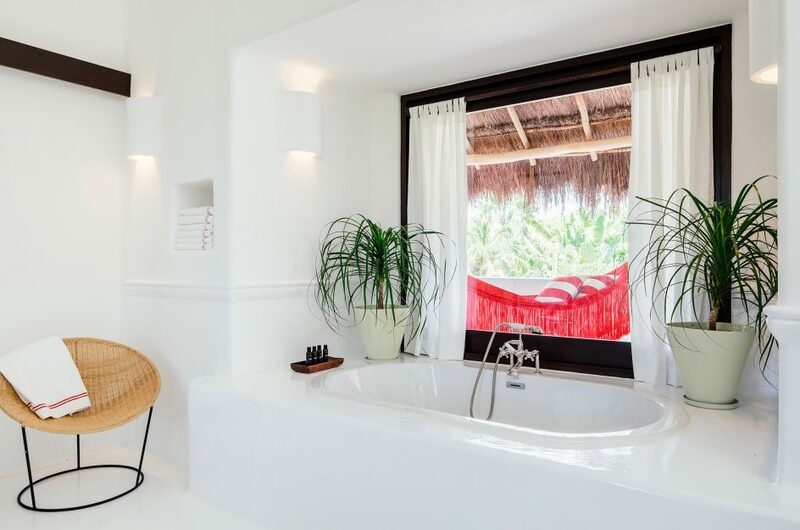 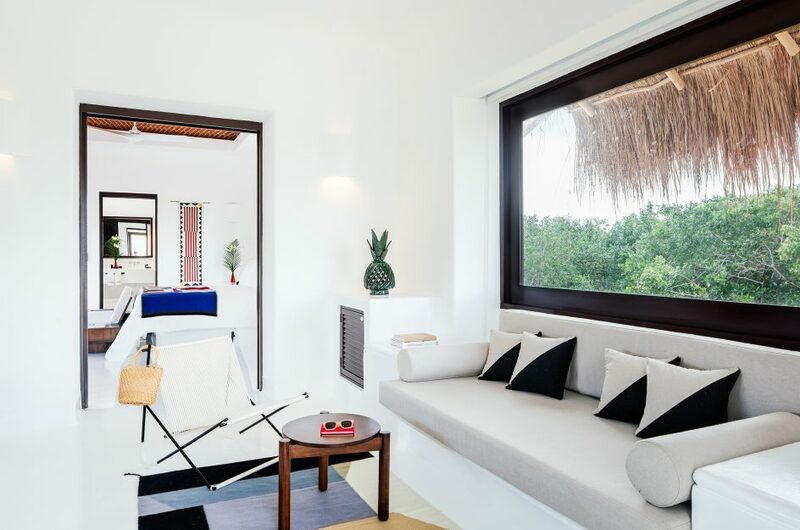 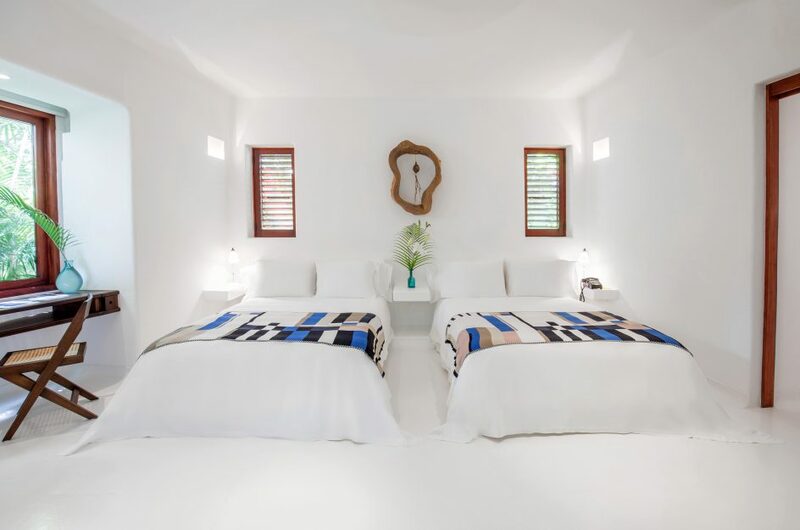 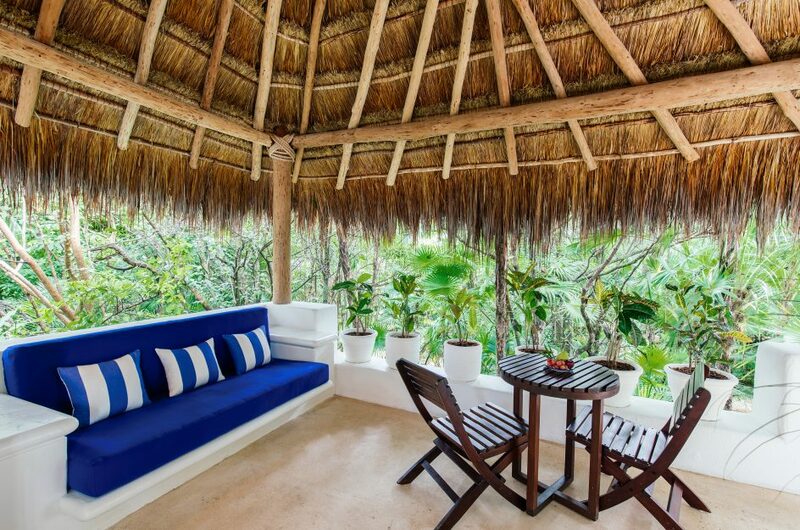 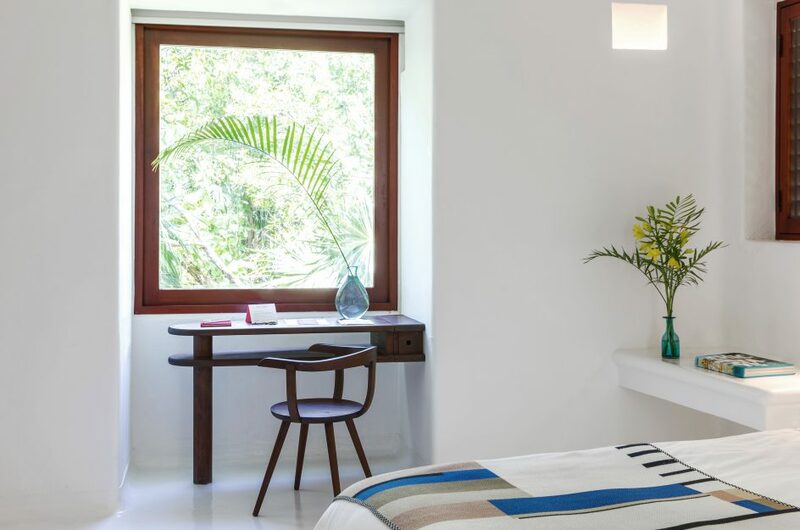 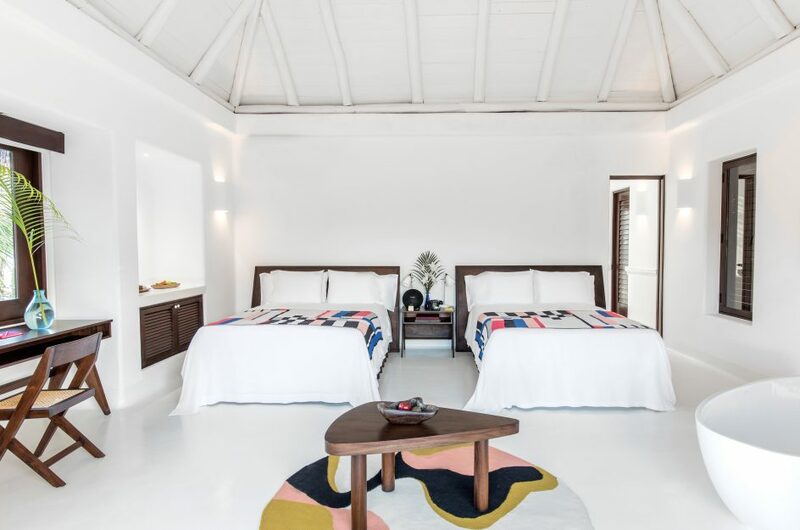 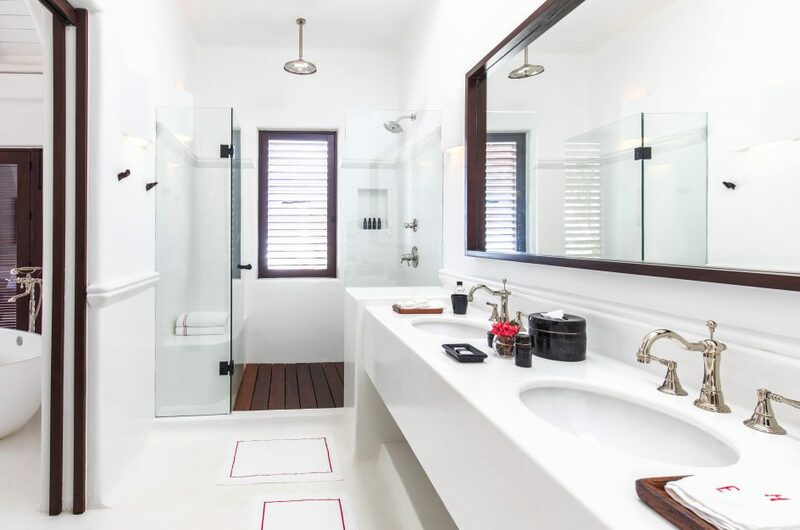 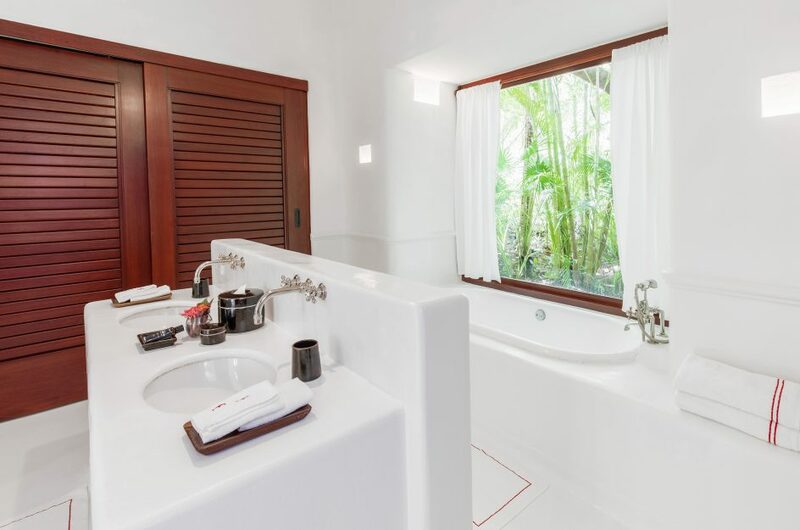 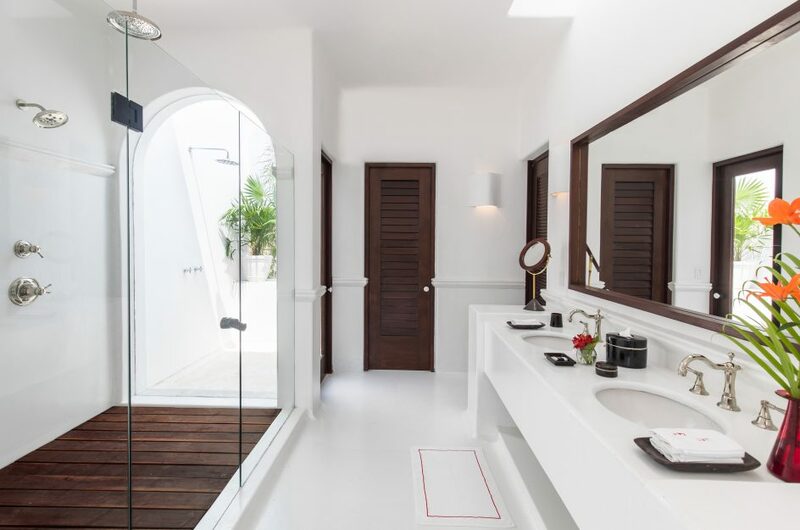 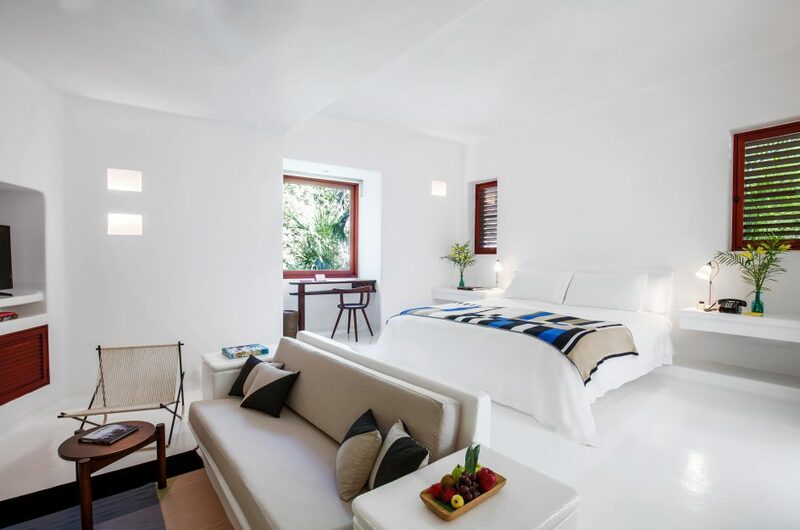 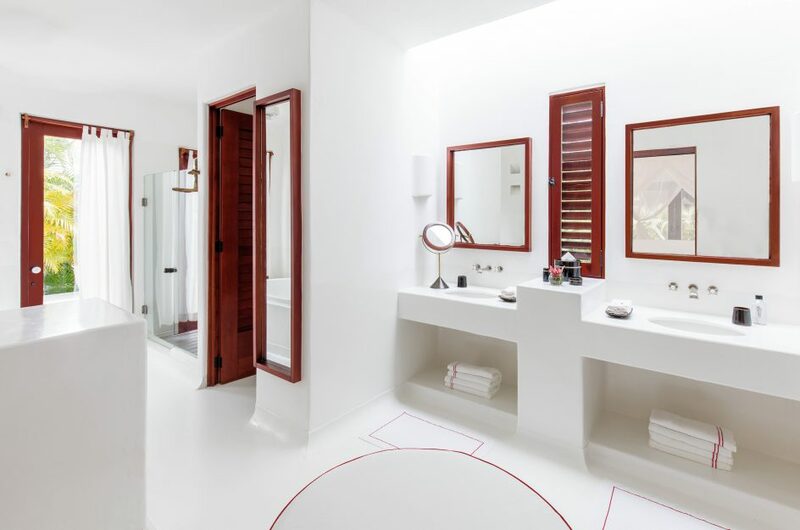 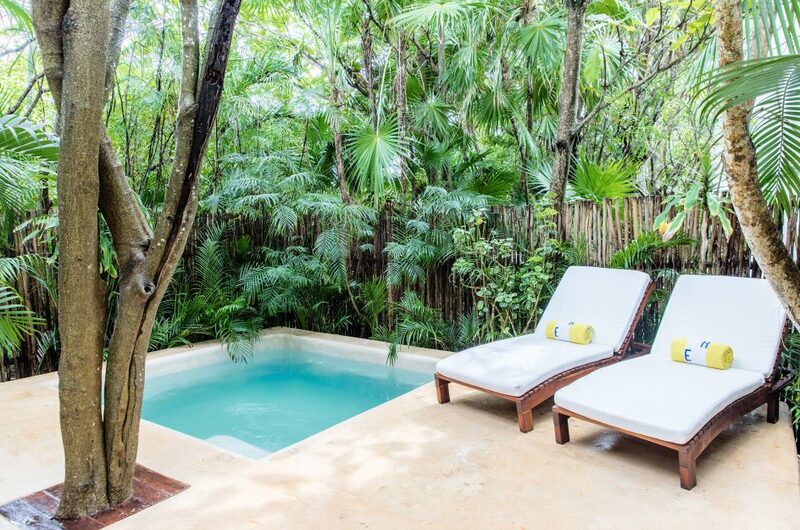 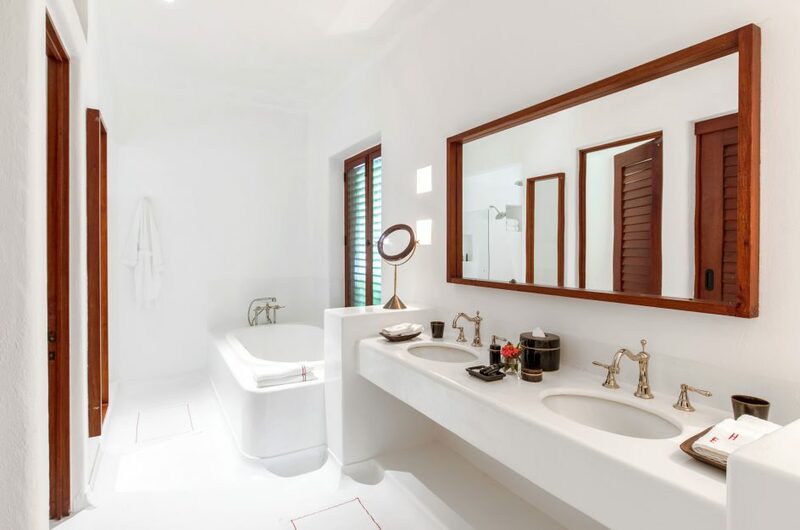 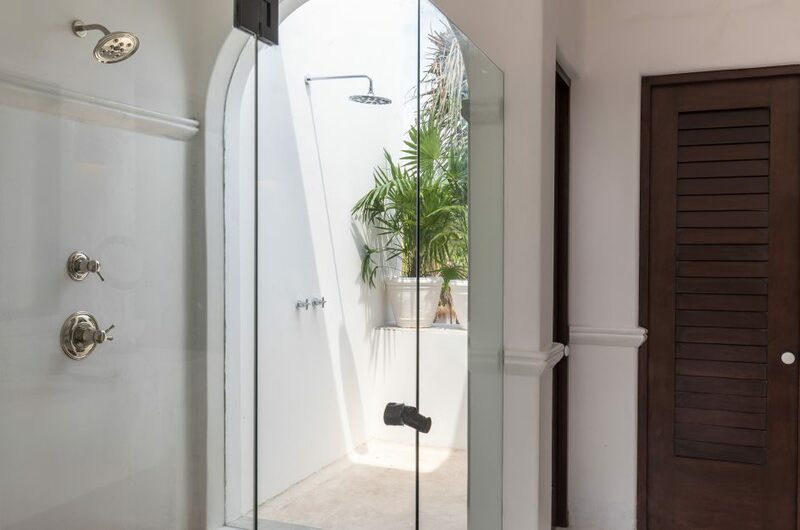 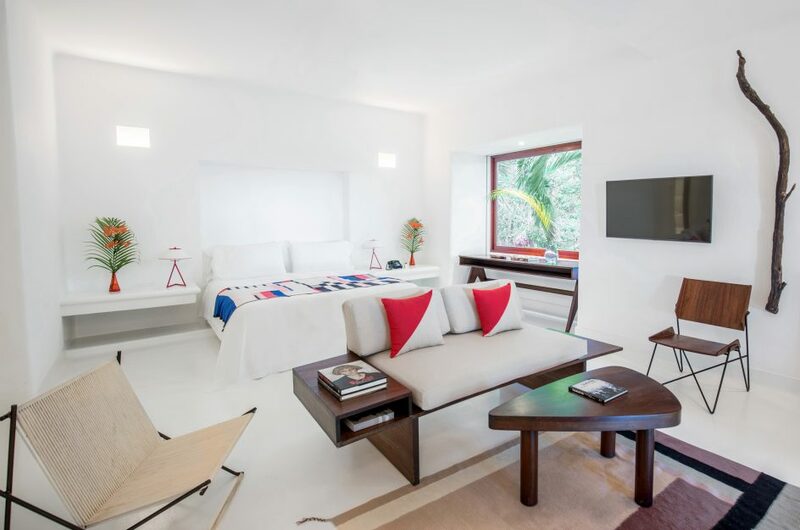 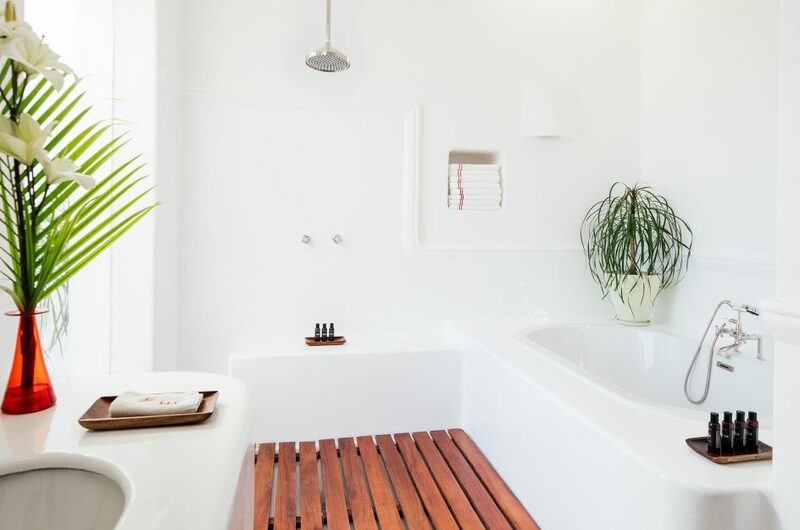 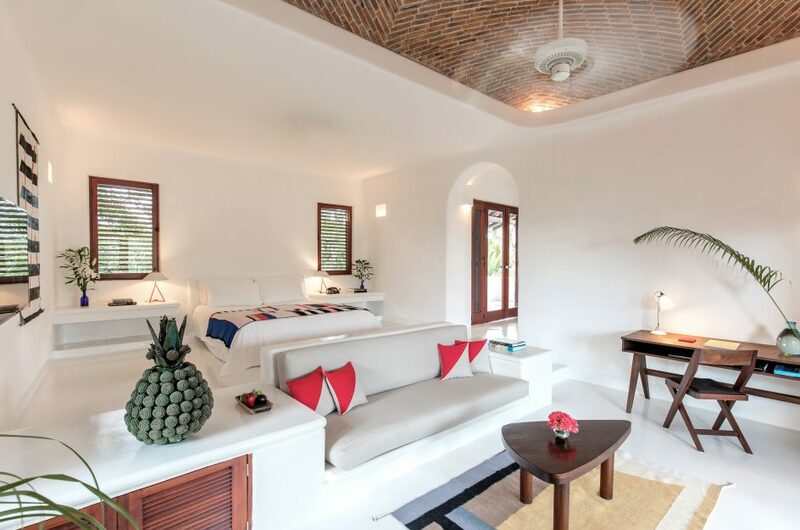 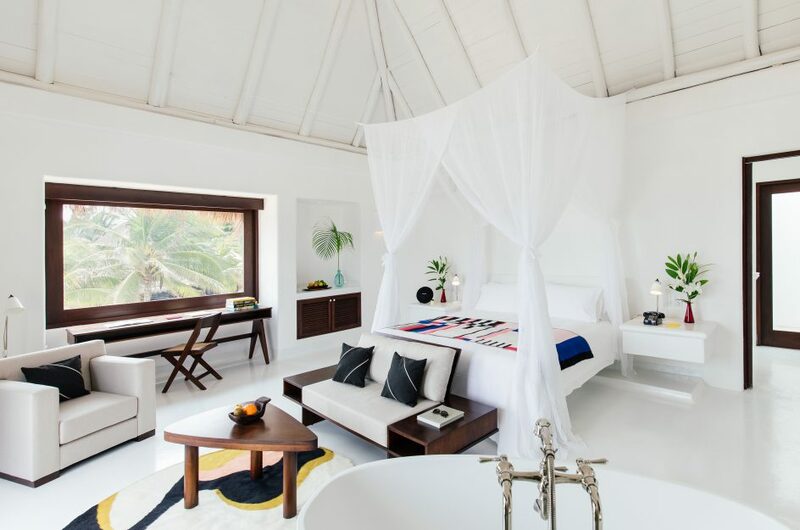 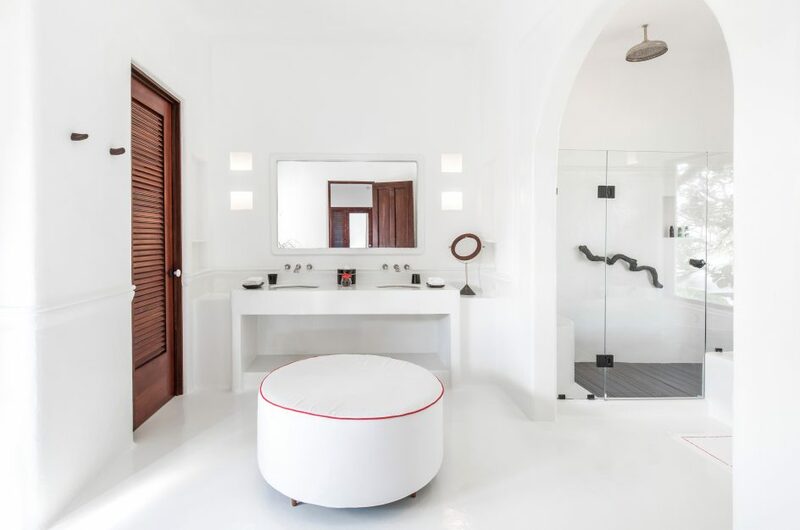 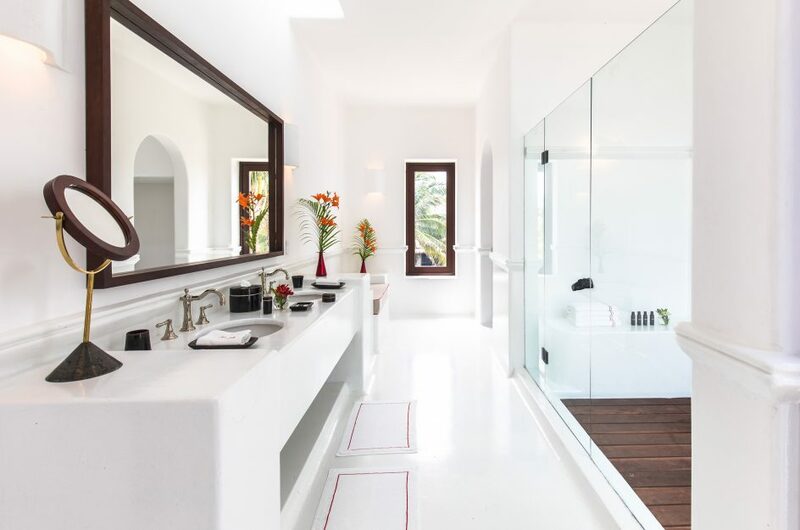 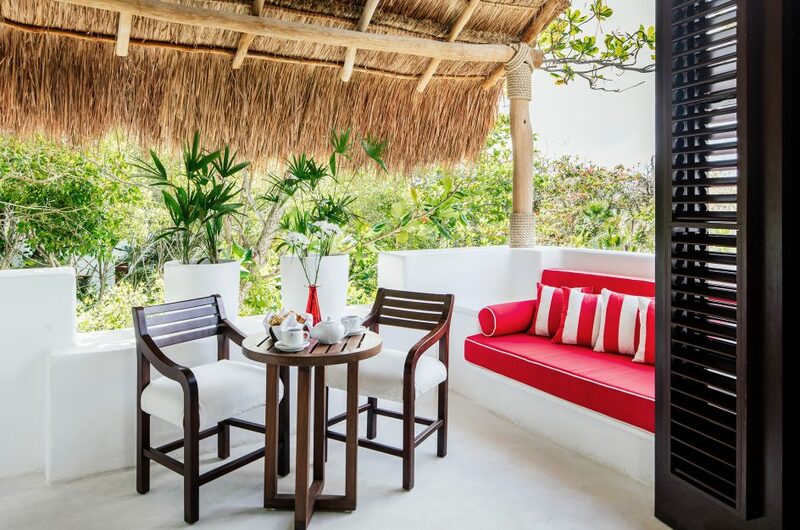 All Jungle Suites at Hotel Esencia also feature spacious all-white bathrooms, an in-room double bathtub, walk-in closets, large screen wi-fi connected televisions, and in-room sound systems that are easy to connect to iPhones and other digital accessories. 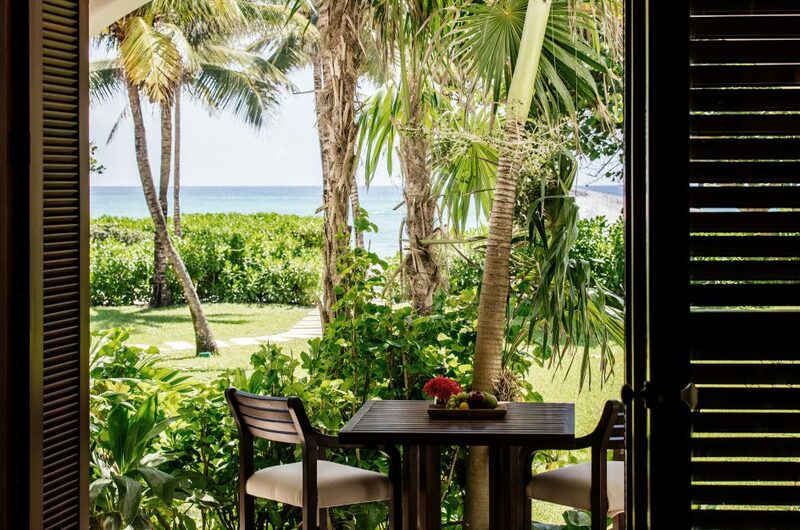 Jungle rooms are spacious private hideaways enveloped by the palm jungle set back 200 meters from the main house but only a short two minute walk to the beach and restaurants. 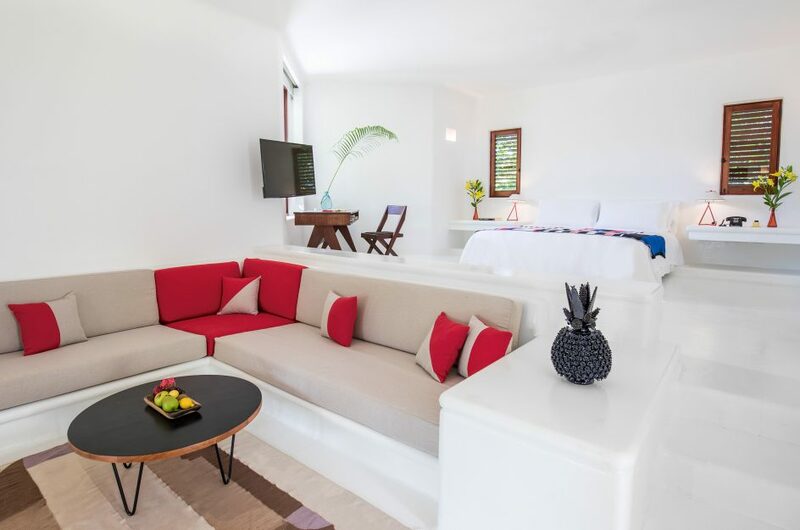 Available with one king or two queen beds, the Jungle Rooms have a total of 60 sqm. 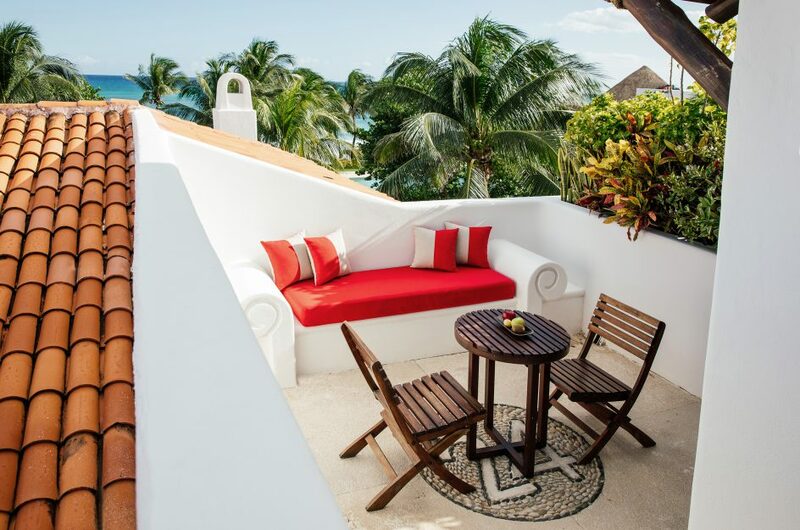 including the private terrace with seating area. 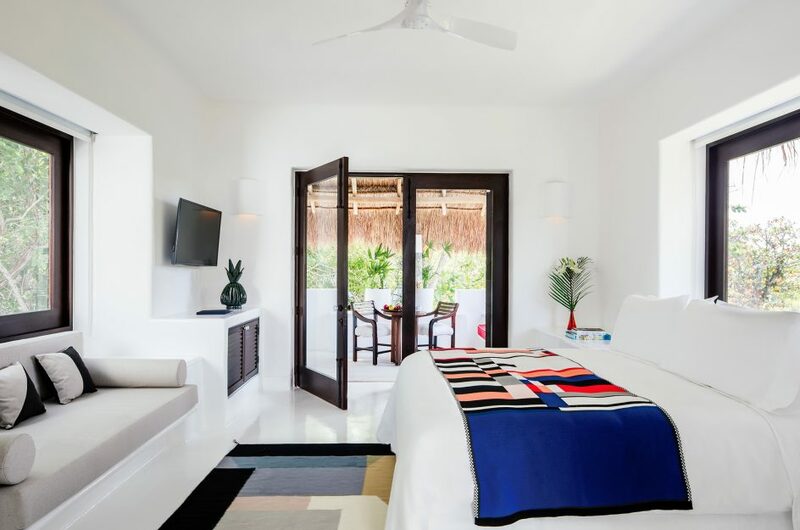 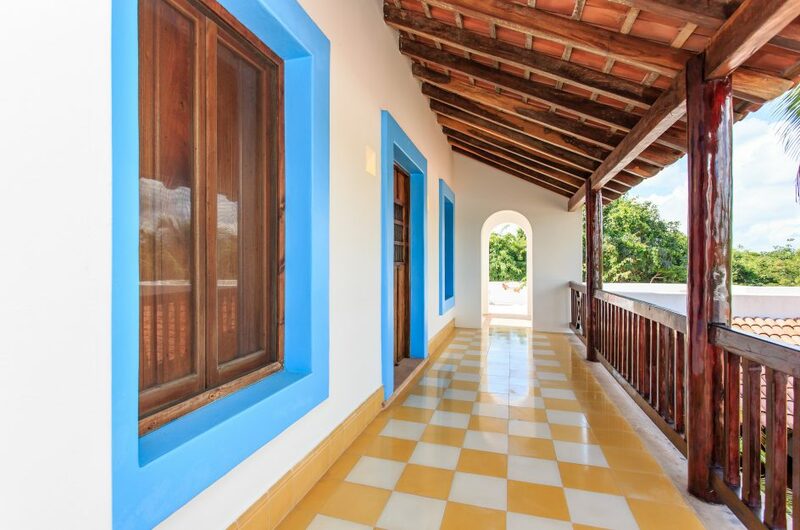 All accommodations at Hotel Esencia feature walk-in closets, large screen high definition televisions, and in-room sound systems that are easy to connect to iPods and other digital accessories. 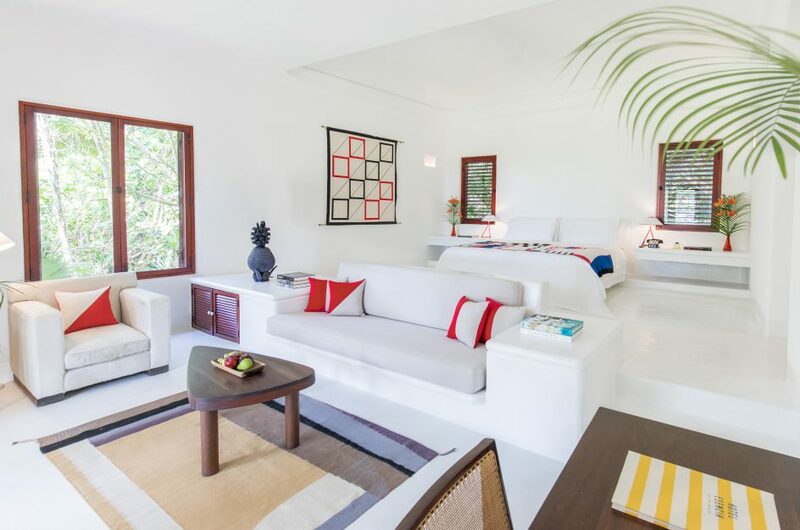 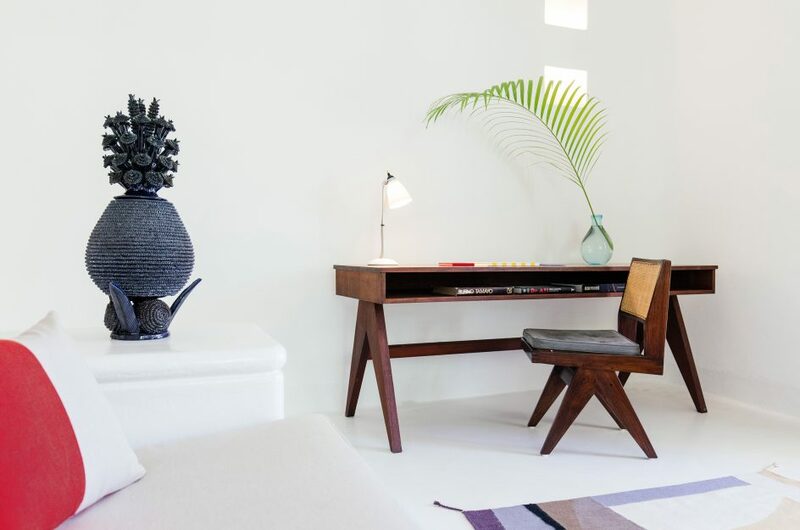 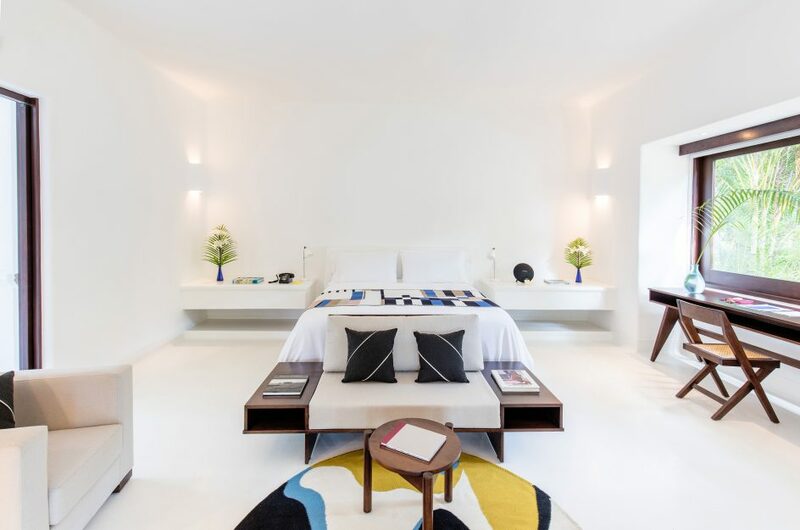 Hidden in the garden foliage, the two-bedroom, two storey Pool Villas offer unparalleled serenity and privacy. 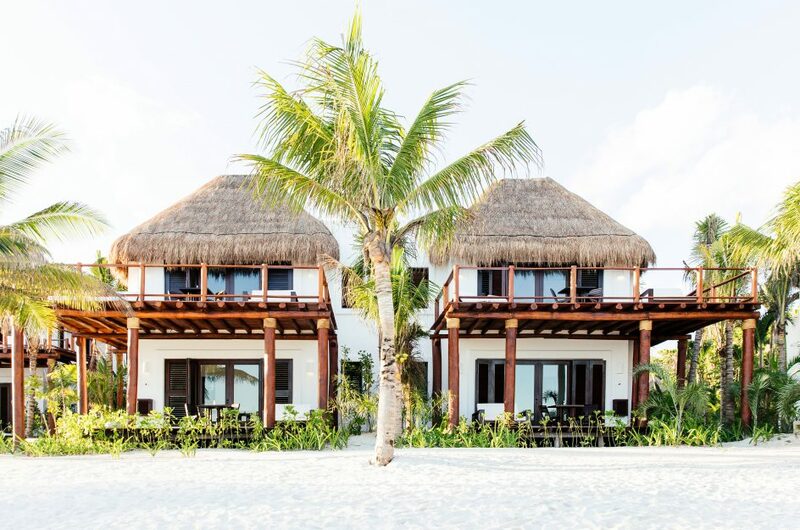 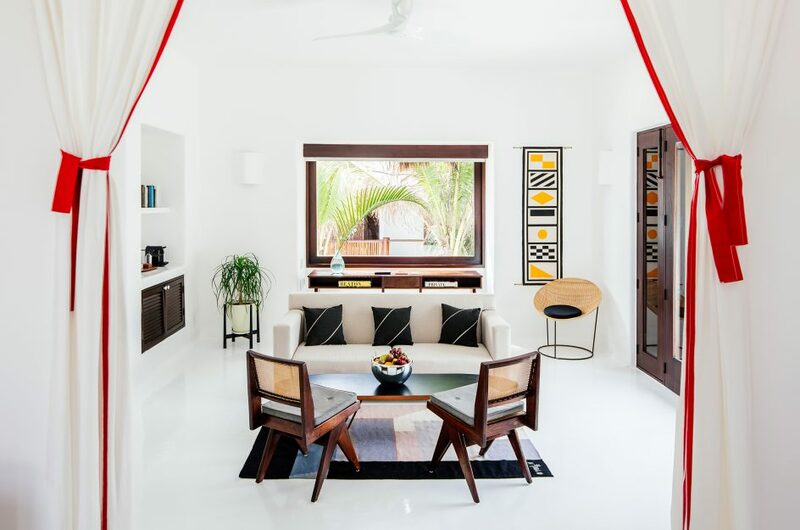 Rather than beach bungalows these are well-appointed residences unto themselves, with multiple terraces, a media room, and a courtyard furnished with hammocks, entertaining furniture, and full-size swimming pool. 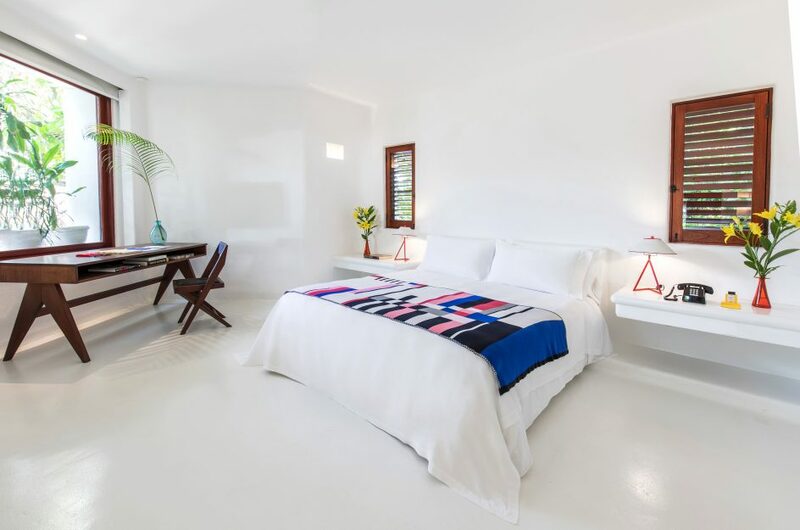 All accommodations at Hotel Esencia feature walk-in closets, large screen high definition televisions, and an in-room sound system with hookup for iPods and other digital accessories. 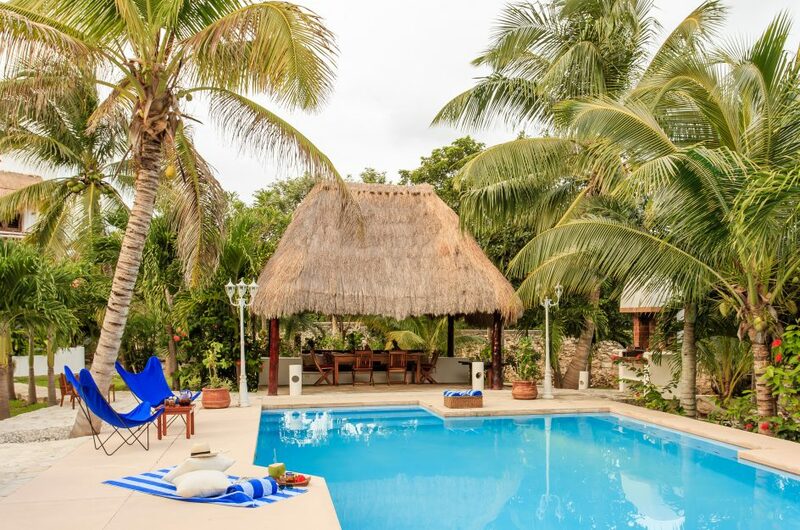 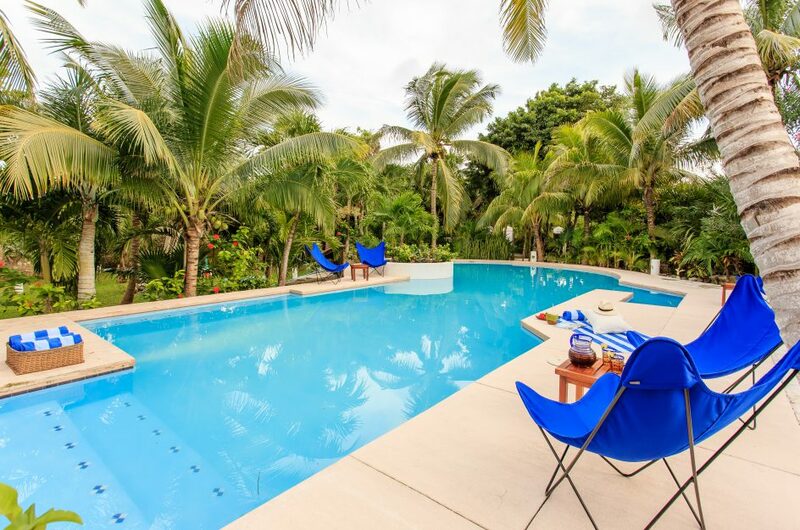 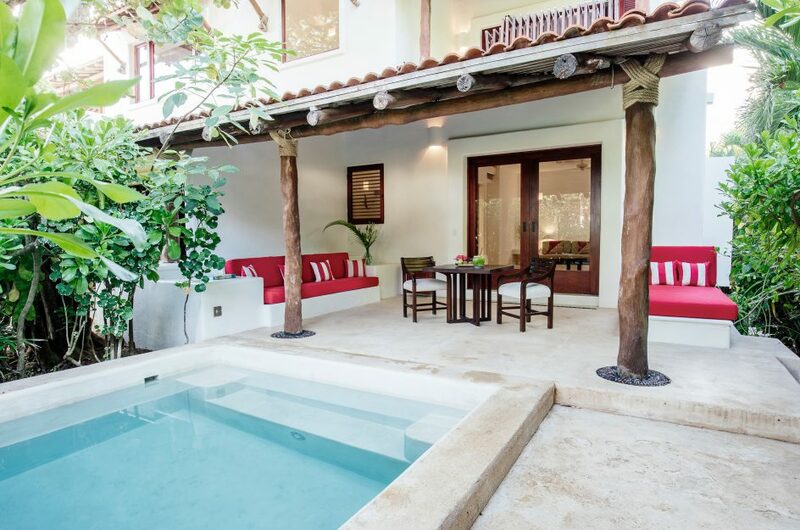 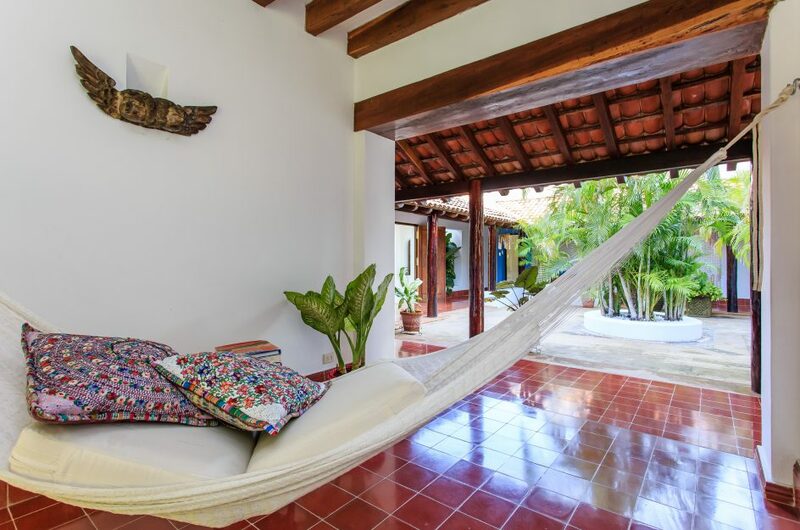 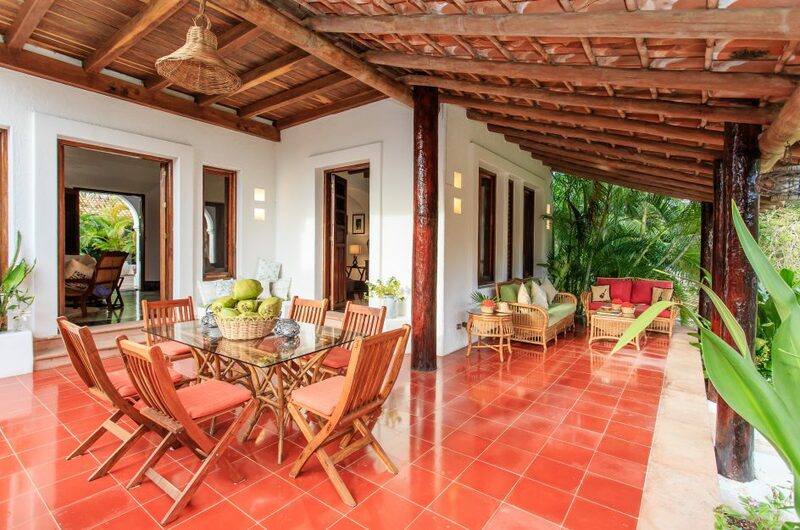 ‘Yum-Ha’ is a majestic colonial-style Villa discreetly located on a lush 15 acre property right next to Hotel Esencia. 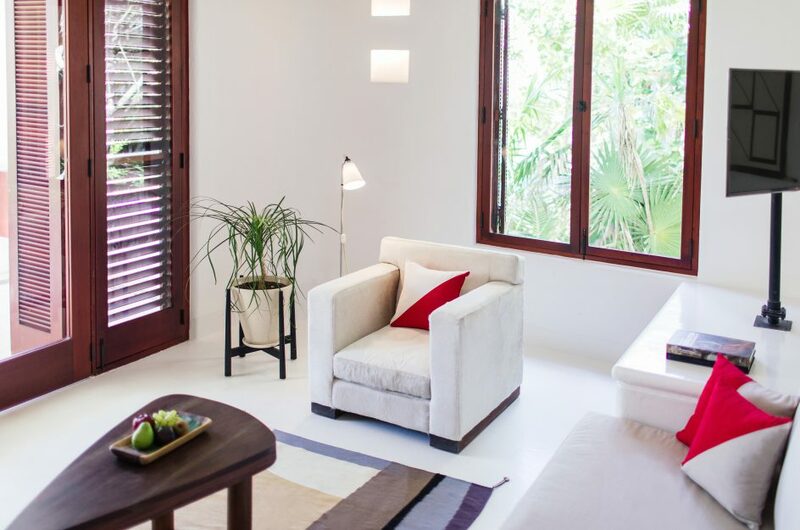 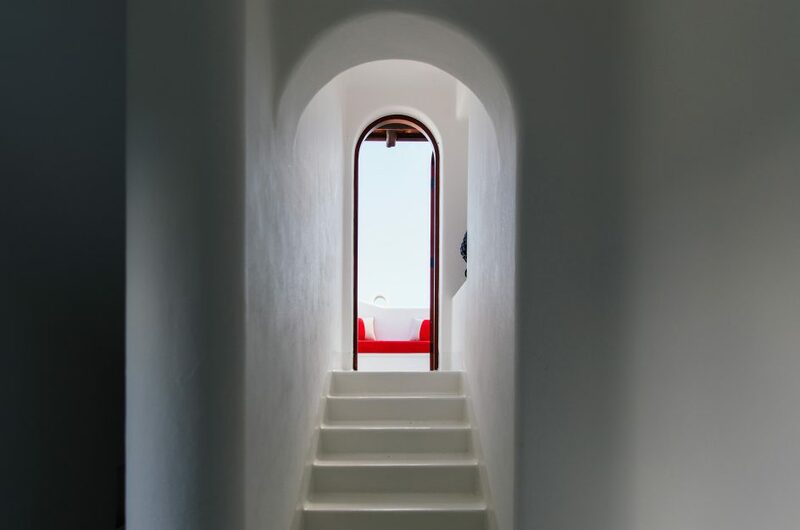 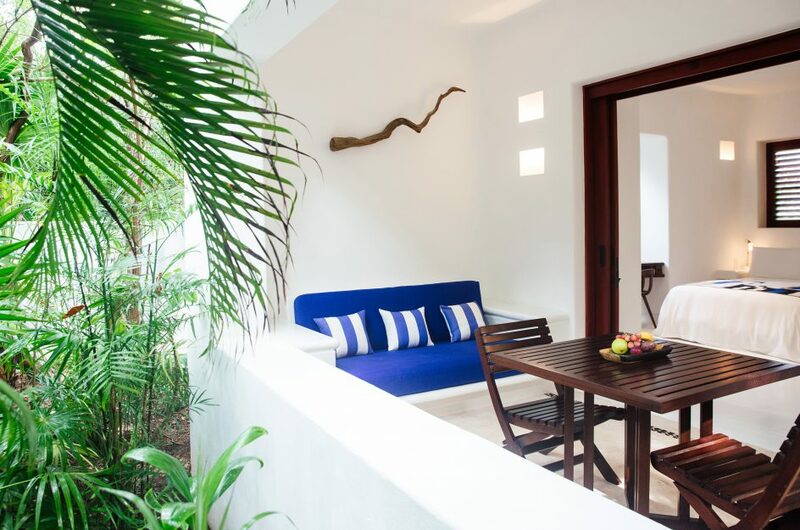 The 3-bedroom Villa is just a 3 minute walk from the beach and can accommodate up to 8 people on 3 levels. 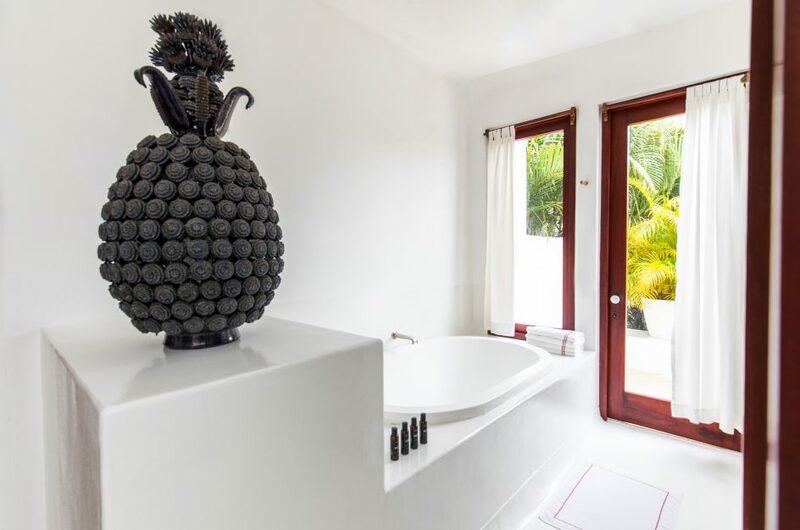 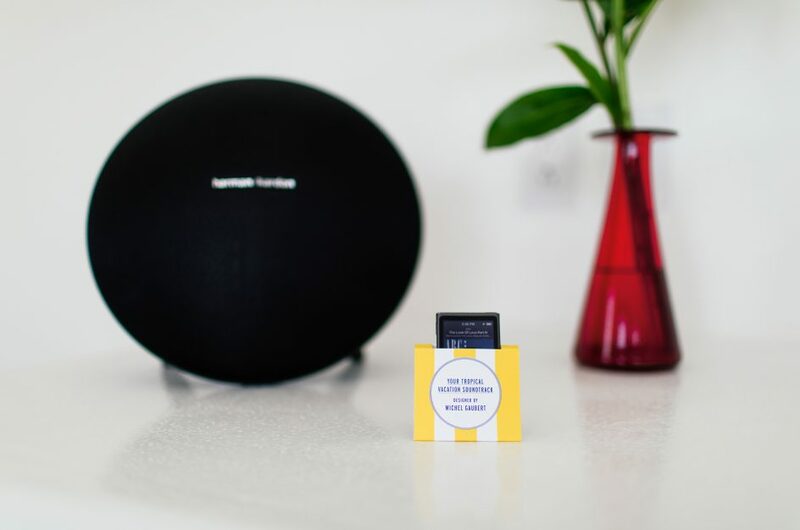 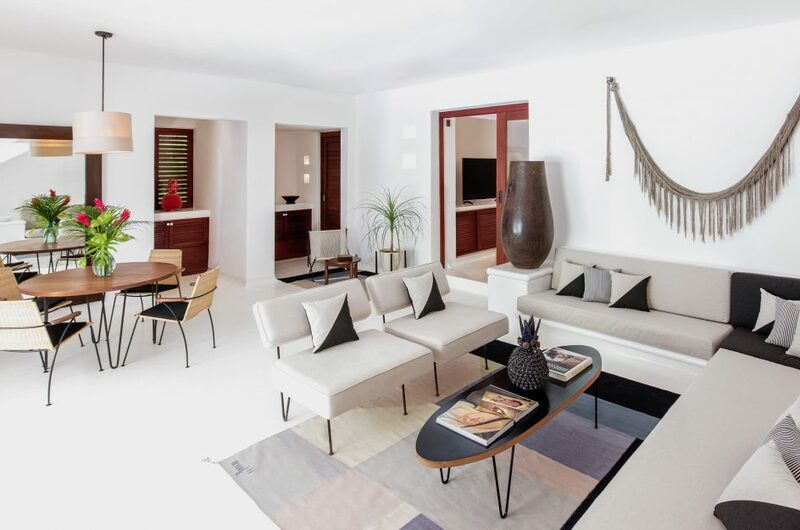 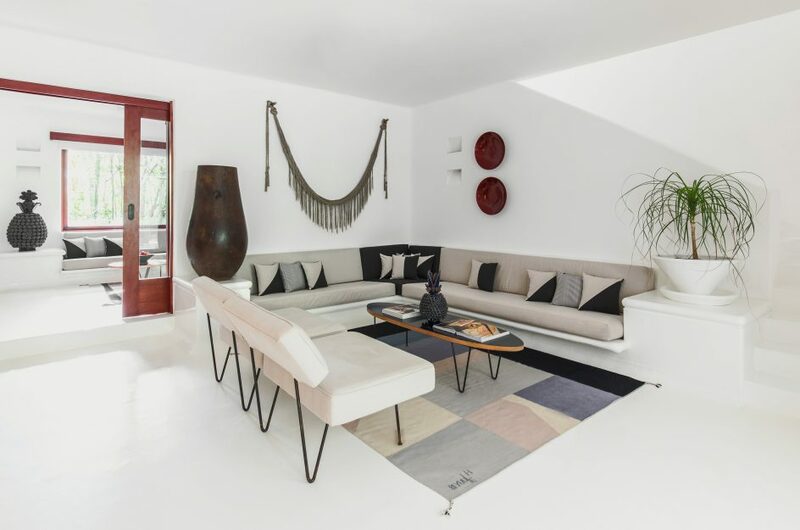 The property features ensuite bathrooms and private terraces overlooking the garden, a fully stocked kitchen, living room, dining room, and a terrace with outdoor dining area. 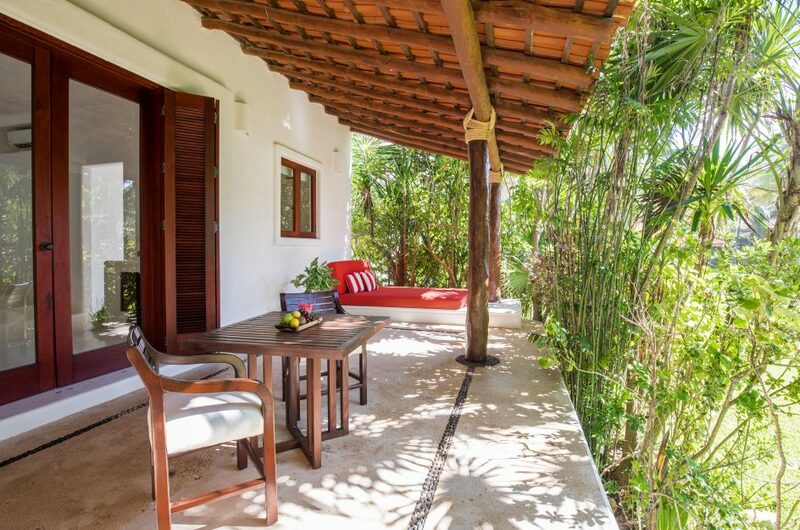 Villa Yum-Ha comes with a private butler, private cook and house keeping services. 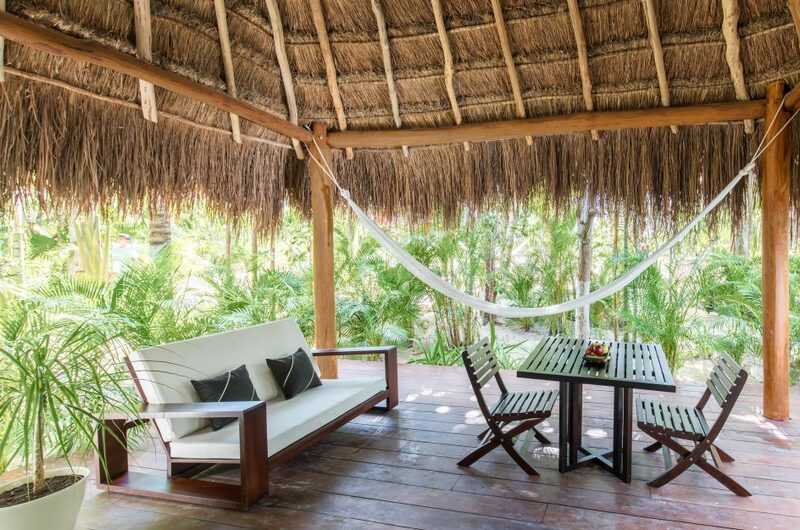 Guests of Yum-Ha villa have the added privilege of enjoying nearly 30 feet of private beachfront.